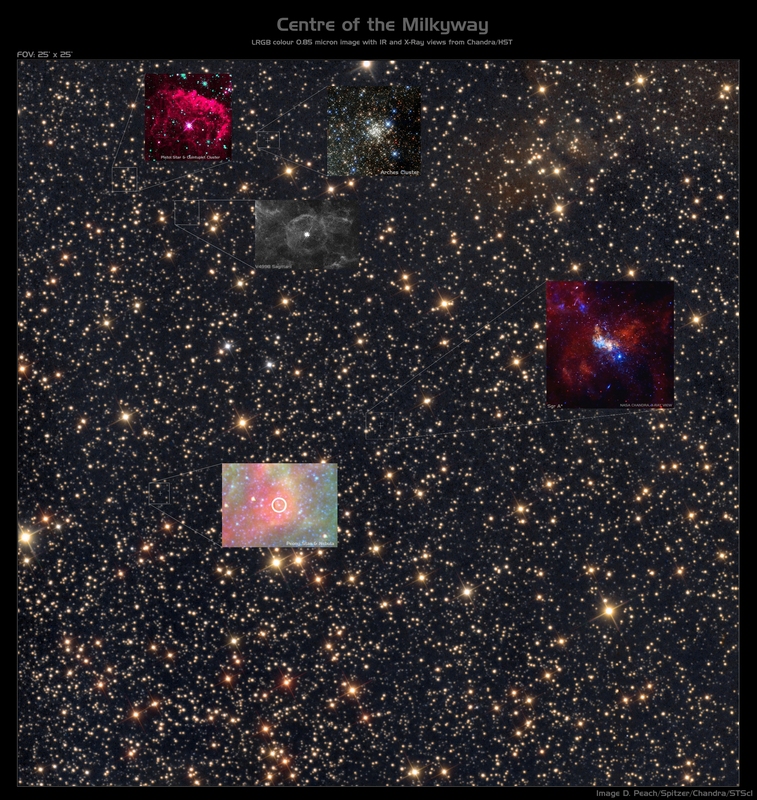 In this section you'll find Deep Sky imagery obtained with a variety of telescopes and cameras. While certainly not my primary interest, i do enjoying exploring the distant universe when time allows with a particular interest in the more unusual and remote objects. The quasar's redshift indicates that it is located about 8 billion light years from Earth, while the lensing galaxy is at a distance of 400 million light years. The apparent dimensions of the entire foreground galaxy are 0.87 × 0.34 arcminutes, while the apparent dimension of the cross in its centre accounts for only 1.6 × 1.6 arcseconds. Mars and Saturn alongside the bright globular star cluster Messier 22 in Sagittarius on March 31st, 2018. My own asteroid moving through a field of galaxies in Virgo on March 27 and 28th, 2018. 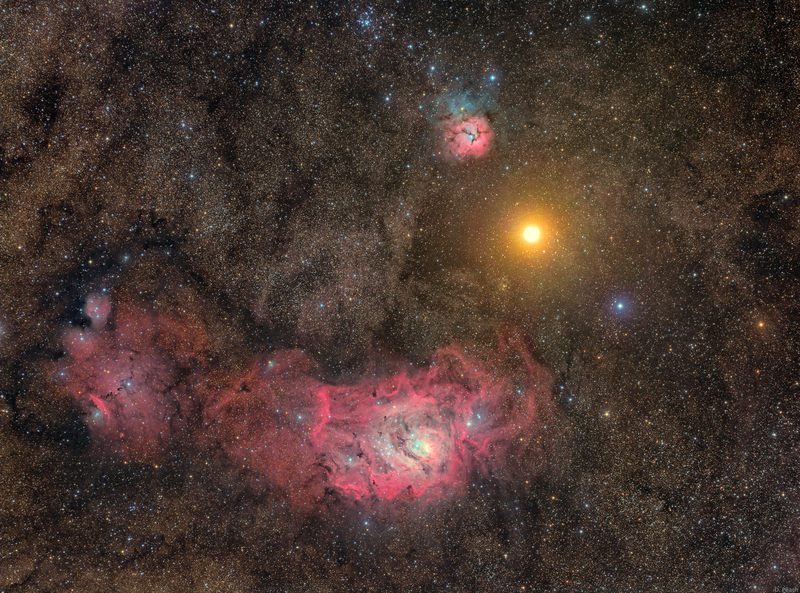 Mars placed between the famous Lagoon and Trifid Nebulae in Sagittarius on March 18th, 2018. Spanning just 18 arc seconds in apparent diameter this is a challenging object for ground based telescopes. Eta Carinae is is a stellar system of two stars with a combined luminosity greater than five million times that of the Sun. It is located 7,500 light-years away constellation Carina. Previously a 4th-magnitude star, it suddenly brightened in 1843 to briefly become the second brightest star in the sky before fading to near the limit of naked eye visibility where it remains today. 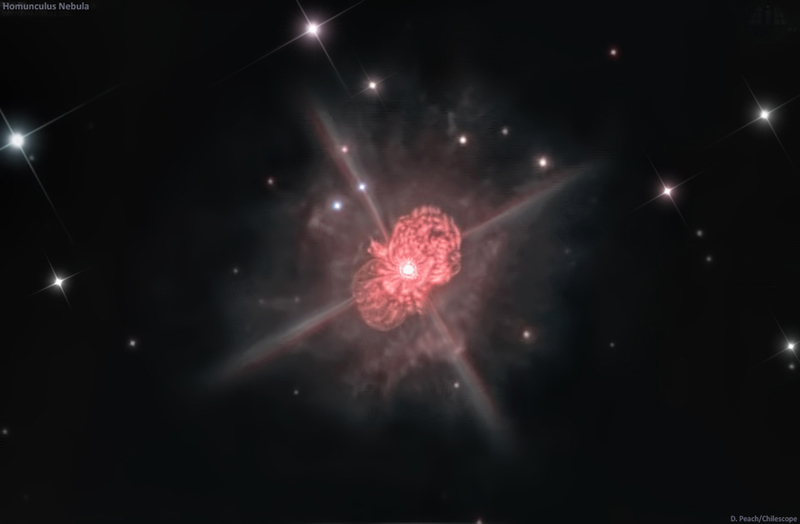 The doubled lobed nebula you see here surrounding the star was created during the eruption event in 1838 and today obscures much of the stars light. 1m telescope with ASI290MM camera. A face on spiral galaxy in the Ursa Major constellation. In the Catalogue of Named Galaxies, it is called Opimus Ursae Majoris, or the abundant galaxy. It was discovered on 6 February 1788 by William Herschel. It is one of the brightest spiral galaxies in the Ursa Major South galaxy group, and is roughly 67,000 light years in diameter. It is approximately 43 million light years away from Earth. NGC 3938 is classified as type Sc under the Hubble sequence, a loosely wound spiral galaxy with a smaller and dimmer bulge. The spiral arms of the galaxy contain many areas of ionized atomic hydrogen gas, more so towards the center. 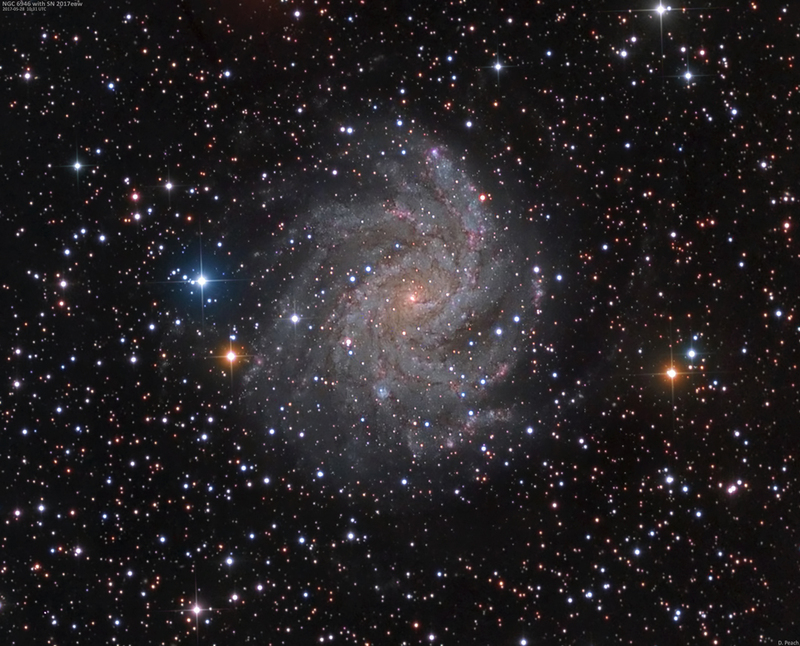 Also known as the Fireworks Galaxy) is an intermediate spiral galaxy about 22 million light-years away, in the constellations Cepheus and Cygnus. In the Catalogue of Named Galaxies, it is called 'Pyrobolus Cygni', or the "Fireworks Galaxy", because of the record number of supernovae discovered in it. It was discovered by William Herschel on 9 September 1798. 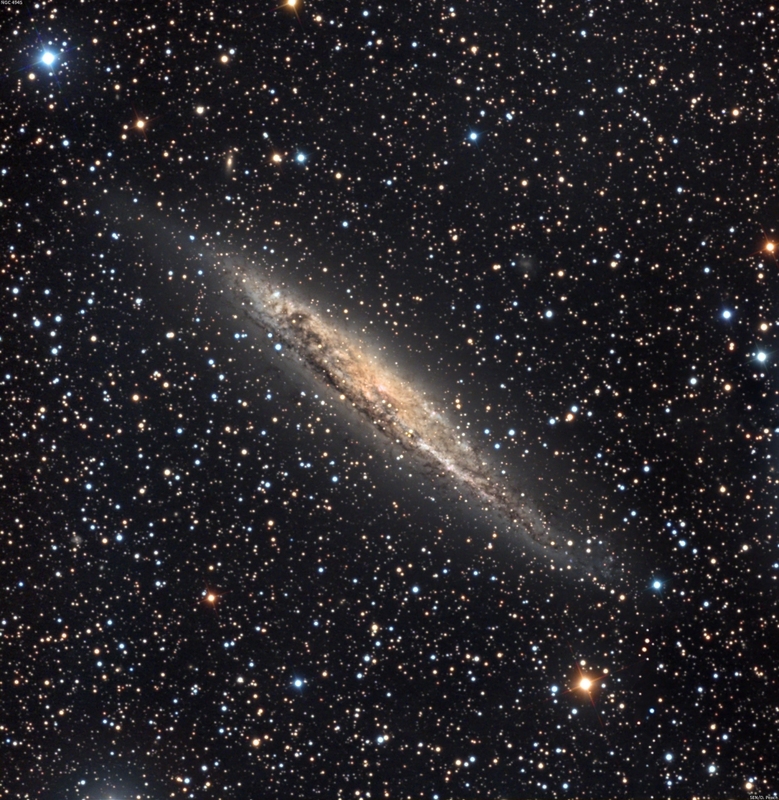 NGC 6946 is highly obscured by interstellar matter of the Milky Way galaxy, as it is quite close to the galactic plane. 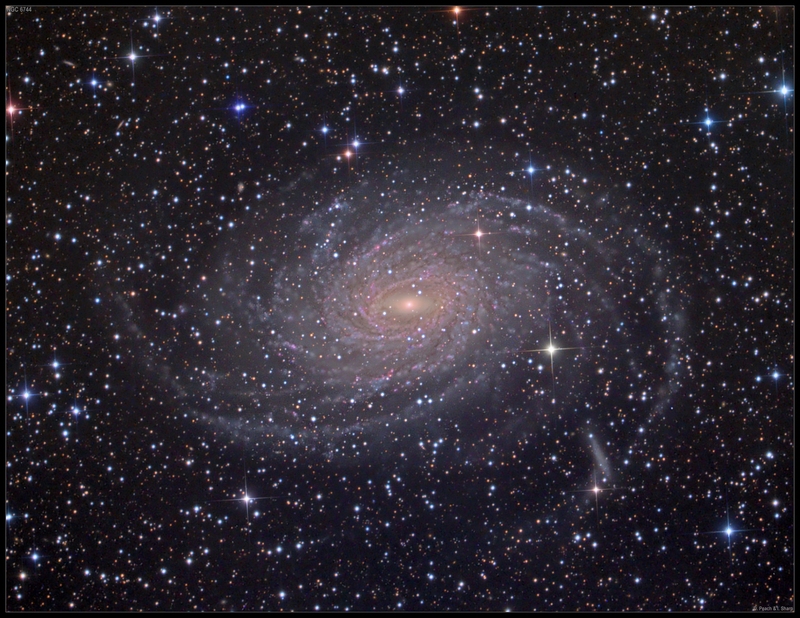 The true diameter of the galaxy is approximately 40,000 light-years or just about one-third of the Milky Way's size. In the past century, ten supernovae have been observed to explode in the arms of this galaxy, which has been classified as a starburst galaxy. In recent times nearby Proxima Centauri was discovered to have a planet in orbit around it located within the habitable zone of the star. This planet is around 1.3x Earth's mass, while it whizzes around Proxima once every 11 days. Perhaps one day we will venture there to explore it, though even this nearby star is thousands of years away with existing propulsion technology. Saturn seen against the dense star clouds toward the centre of the galaxy. Inumurable stars litter the field like grains of sand. Titan can be easily seen alongside Saturn just to the right of the planet itself. 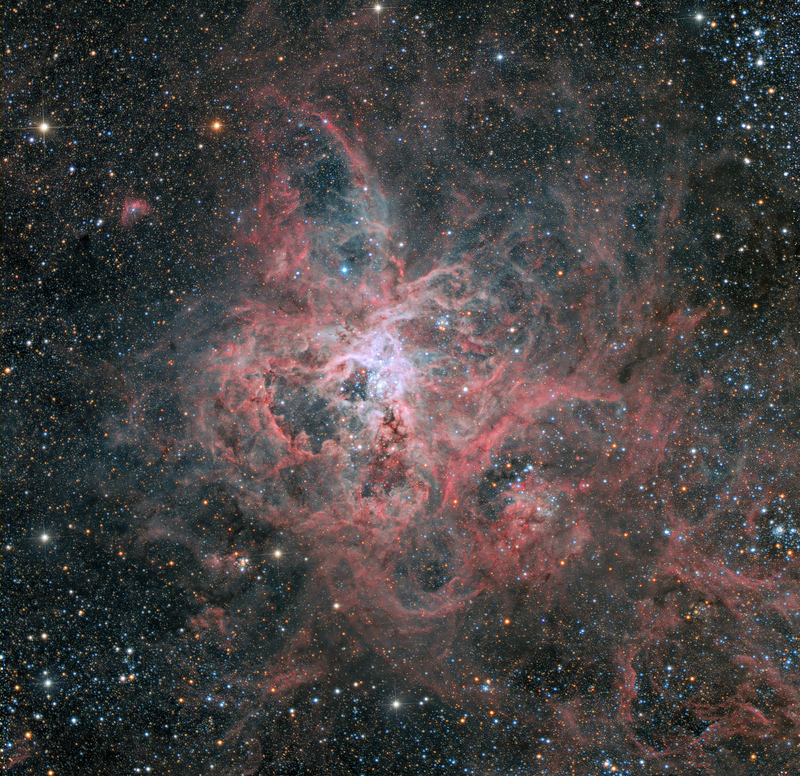 Considering its distance of about 160,000 light-years, The Tarantula Nebula is an extremely luminous non-stellar object. 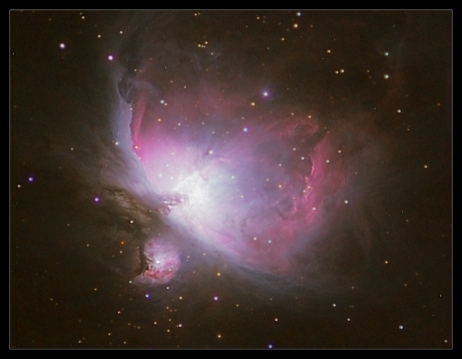 Its luminosity is so great that if it were as close to Earth as the Orion Nebula, it would cast shadows. It is the most active starburst region known within the Local Group of galaxies and the star cluster at its heart (R136) contains the most massive and luminous star known (R136a1.) This star radiates more energy in 5 seconds than our Sun produces in a year and it is this star and several other extremely luminous stars in the cluster that make the nebula visible. 27"CDK with FLI camera. HaLRGB. 2/1/1/1/1hrs. 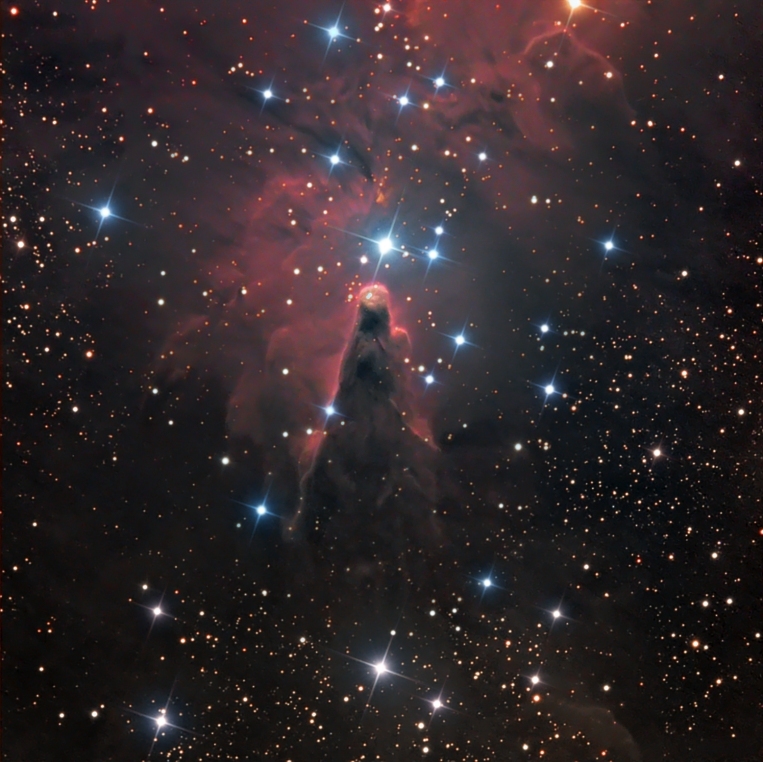 The diffuse Cone Nebula, so named because of its apparent shape, lies in the southern part of NGC 2264, the northern part being the Christmas Tree Cluster. It is in the northern part of the constellation Monoceros. The cone's shape comes from a dark absorption nebula consisting of cold molecular hydrogen and dust in front of a faint emission nebula containing hydrogen ionized by S Monocerotis, the brightest star of NGC 2264. The faint nebula is approximately seven light-years long, and is 2,700 light-years away from Earth. 27" and 20"CDKs with FLI camera. HaLRGB. Located in the southern constellation of Vela, it was discovered by James Dunlop in 1826. It is located at a distance of 16,300 light years from Earth and is an estimated 10.2 billion years old. 27"CDK with FLI CCD. LRGB. 60/15/15/15mins. 27"CDK with FLI camera. Two frame mosaic. HaLRGB. 60/60/30/30/30mins. The Hydra Cluster (or Abell 1060) is a galaxy cluster that contains 157 bright galaxies, appearing in the constellation Hydra. The cluster spans about ten million light years across and has an unusually high proportion of dark matter. The cluster's largest galaxies are elliptical galaxies NGC 3309 and NGC 3311 and the spiral galaxy NGC 3312 all having a diameter of about 150,000 light years. The cluster is 160 million light years away. 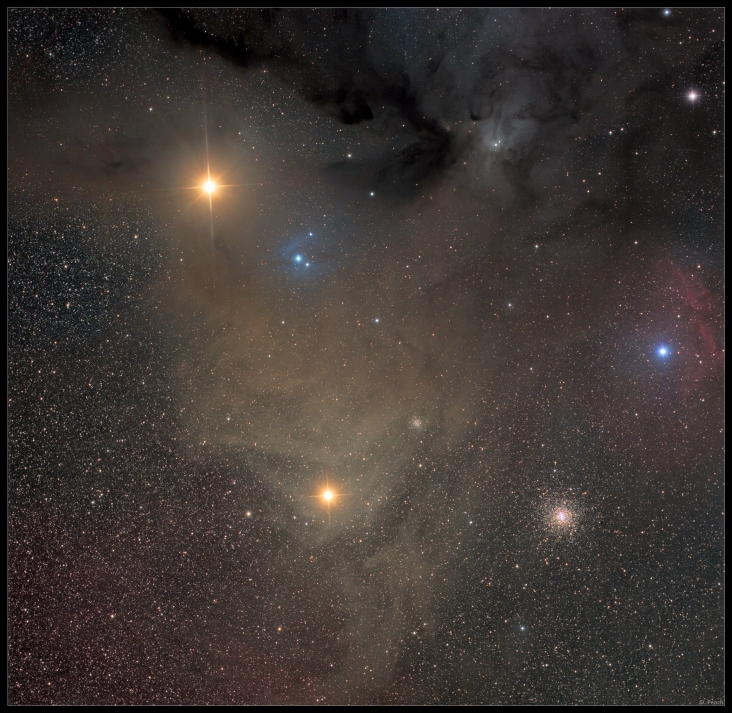 The Rho Ophiuchi nebula is a dark nebula of gas and dust that is located 1° south of the star ρ Ophiuchi of the constellation Ophiuchus. This nebula is one of the closest star-forming regions to the Solar System. Only part of the nebula is shown in the above image during a passage of the planet Mars through the region during August 2016. 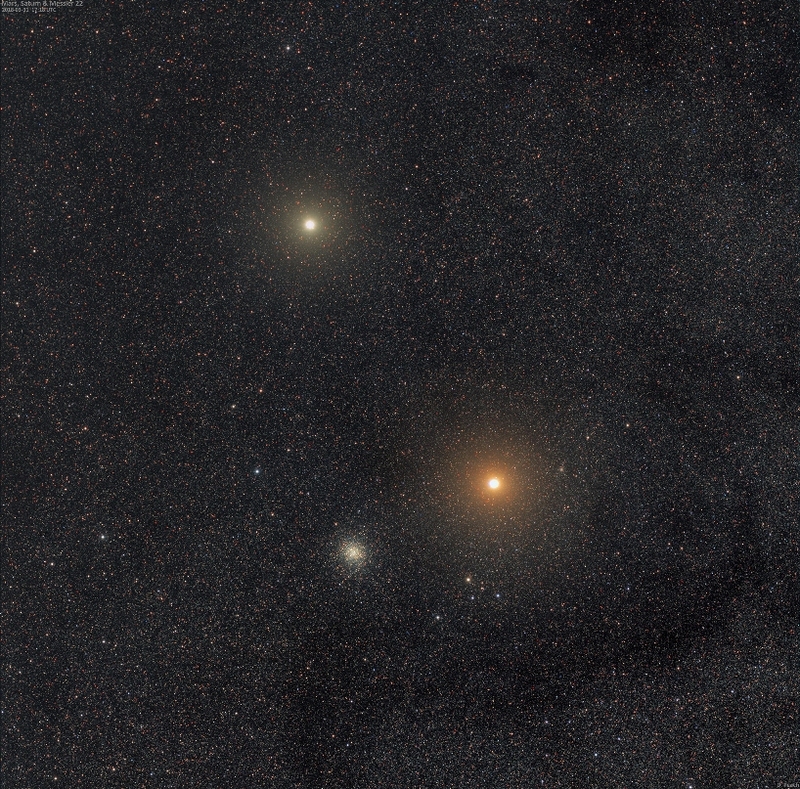 Note how similar the colour of Mars appears to the red supergiant star Antares which is just below centre. The Carina Nebula (also known as the Great Nebula in Carina, the Eta Carinae Nebula, NGC 3372, as well as the Grand Nebula) is a large complex area of bright and dark nebulosity in the constellation of Carina, and is located in the Carina–Sagittarius Arm. The nebula lies at an estimated distance between 6,500 and 10,000 light years from Earth. 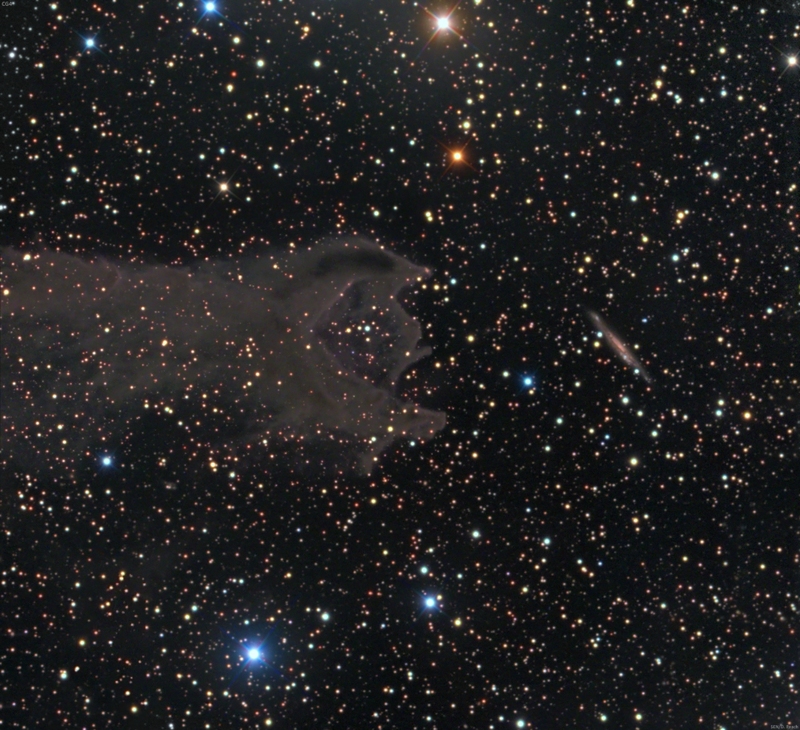 The nebula has within its boundaries the large OB association Carina OB1 and several related open clusters, including numerous O-type stars and several Wolf-Rayet stars. Carina OB1 encompasses the star clusters Trumpler 14 and Trumpler 16. Trumpler 14 is one of the youngest known star clusters, at half a million years old. Trumpler 16 is the home of WR 25, currently the most luminous star known in our Milky Way galaxy, together with the less luminous but more massive and famous Eta Carinae star system, and the O2 supergiant HD 93129A. Trumpler 15, Collinder 228, Collinder 232, NGC 3324, and NGC 3293 are also considered members of the association. 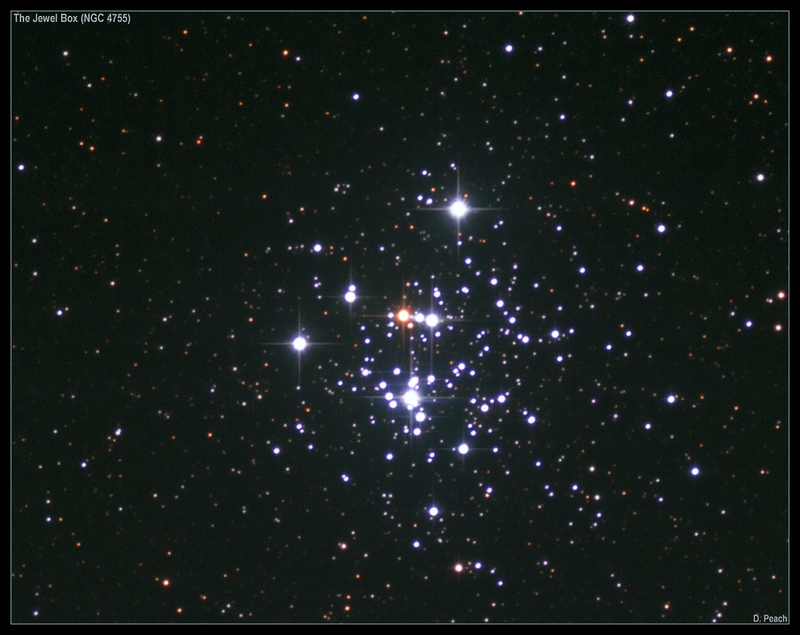 NGC 3293 is the oldest and furthest from Trumpler 14, indicating sequential and ongoing star formation. Presented nearly edge on to us in the sky, this 9th mag sliver of light is one of the finest objects in the large sprawling constellation of Centaurus. NGC 4945 is a nearby spiral galaxy around 12 million light years away. It is often overshadowed by the nearby Omega Centauri and Centaurus A, though is without doubt an impressive object in its own right. The galaxy is unusual in that it contains a bright and active nucleus, which is likely home to a large super-massive black hole. I just happened to be taking some data on February 7th of the bright active galaxy NGC 5128 (Centaurus A) oblivious to the fact a new star had appeared in the galaxy. The following day the Backyard Observatory Supernova Search reported the discovery of this new suspect supernova which was soon confirmed as a supernova explosion. This pre discovery image of the new supernova was taken the day before the object was actually discovered. 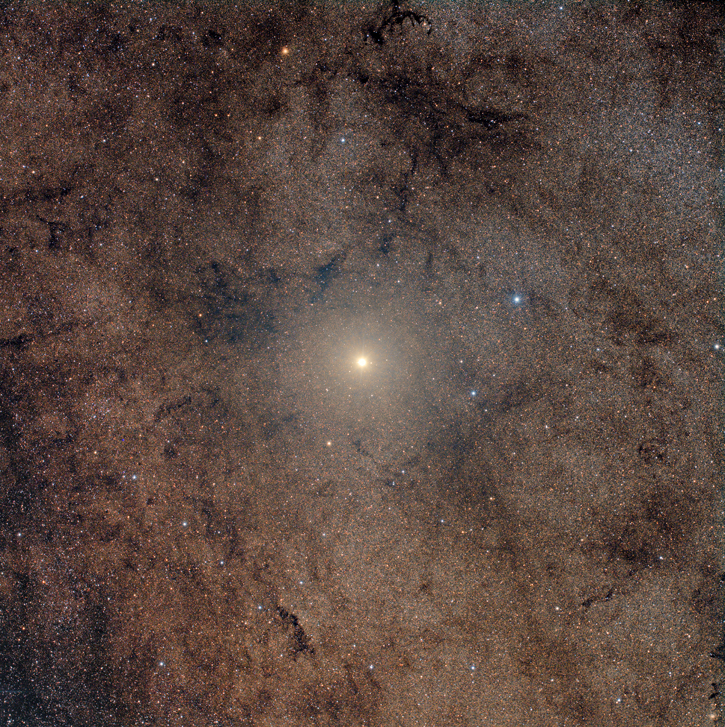 It is located extremely close to a foreground star in our own galaxy (see image inset.) The supernova is over 10 million light years away yet shines brightly across this vast distance. 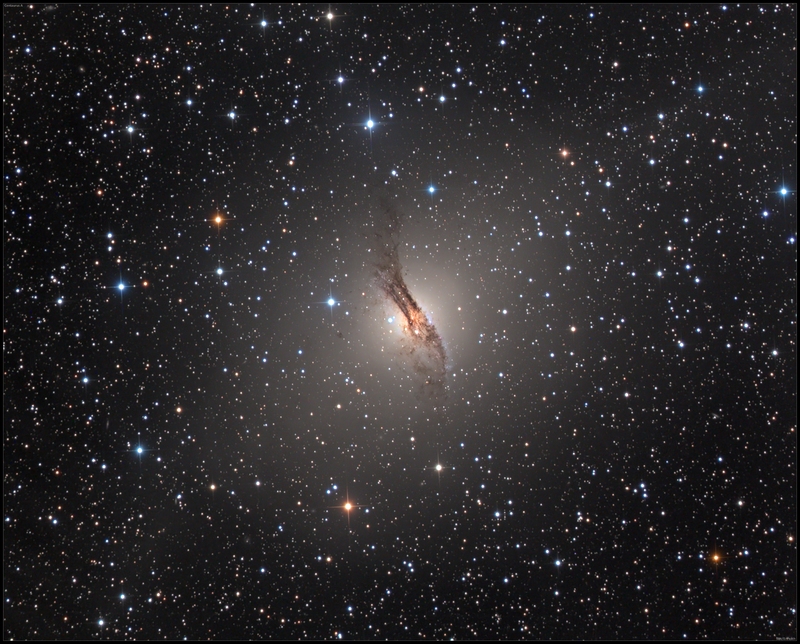 Centaurus A itself is a strong source of radio emissions, and contains an active super-massive black hole of over 50 million solar masses. Cometary globule CG4 with galaxy ESO 257-19 27"CDK with FLI-PL09000. LRGB image. This strange celestial scene resembles some giant mouth about to consume the galaxy at right. In reality it is merely a line of sight effect. The galaxy is 100 million light years further away than the nebula that is seemingly about to consume it. 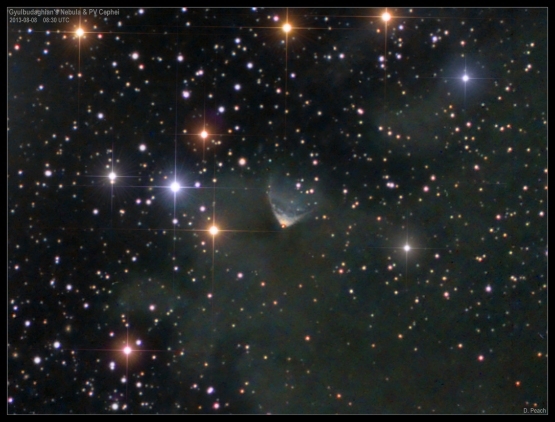 Both objects are located in the constellation Puppis, the nebula being very faint. NGC 1300 is a barred spiral galaxy about 61 million light-years away in the constellation Eridanus. It is a member of the Eridanus Cluster, a cluster of 200 galaxies. It was discovered by John Herschel in 1835. In the core of the larger spiral structure of NGC 1300, the nucleus shows its own extraordinary and distinct "grand-design" spiral structure that is about 3,300 light-years long. Only galaxies with large-scale bars appear to have these grand-design inner disks — a spiral within a spiral. Models suggest that the gas in a bar can be funnelled inwards, and then spiral into the center through the grand-design disk, where it can potentially fuel a central black hole. NGC 1300 is not known to have an active nucleus, indicating that its central black hole is not accreting matter. 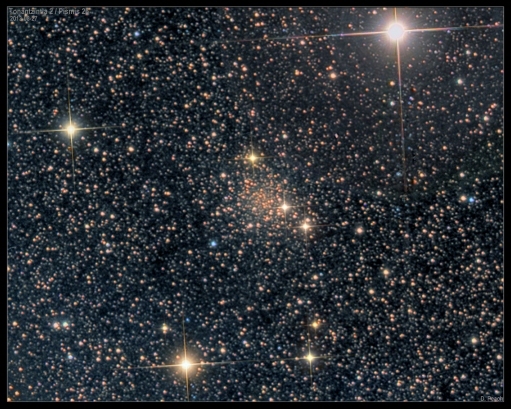 Globular Cluster NGC 2808 in Carina 27"CDK with FLI camera. LRGB image. 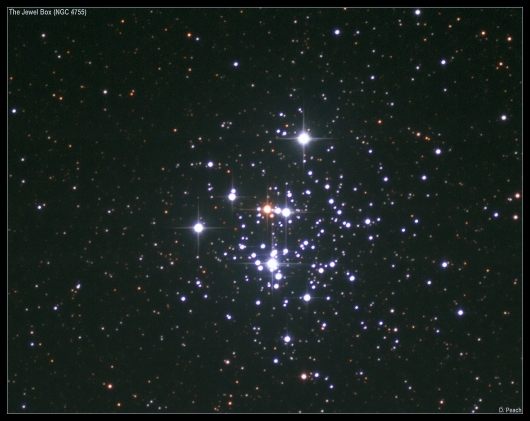 NGC 2808 is a globular cluster in the constellation Carina. The cluster belongs to the Milky Way, and is one of our home galaxy's most massive clusters, containing more than a million stars. It is estimated to be 12.5-billion years old. It is 31,000 light years away. 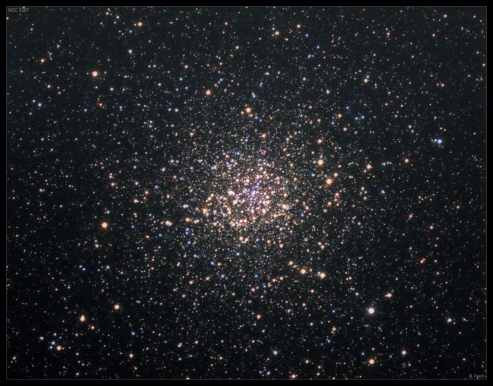 Globular Cluster NGC 288 27"CDK with FLI camera. LRGB image. 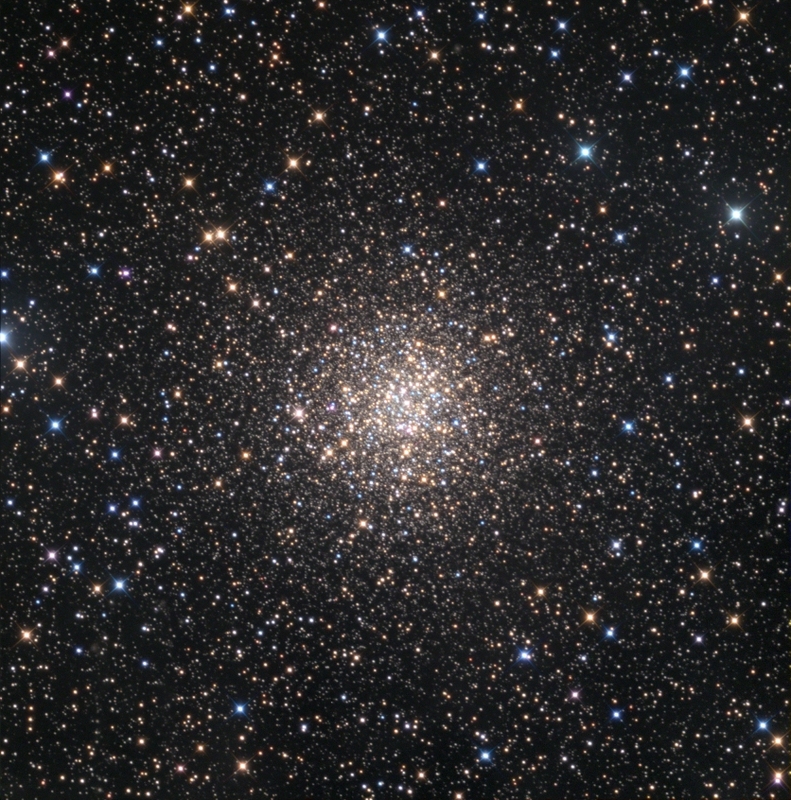 NGC 288 is a globular cluster in the constellation Sculptor. Its visual appearance was described by John Dreyer in 1888. It is located about 1.8° southeast of the galaxy NGC 253, 37′ north-northeast of the South Galactic Pole, 15′ south-southeast of a 9th magnitude star, and encompassed by a half-circular chain of stars that opens on its southwest side. It can be observed through binoculars. It is not very concentrated and has a well resolved, large 3′ dense core that is surrounded by a much more diffuse and irregular 9′ diameter ring. Peripheral members extend farther outward towards the south and especially southwest. 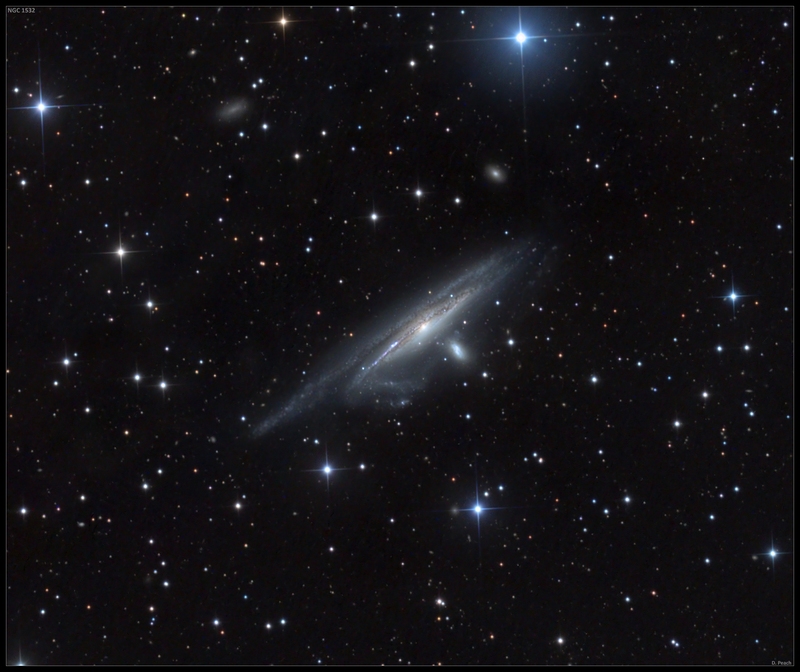 Interacting galaxies NGC 1532/31 in Eridanus 27"CDK with FLI camera. LRGB image. 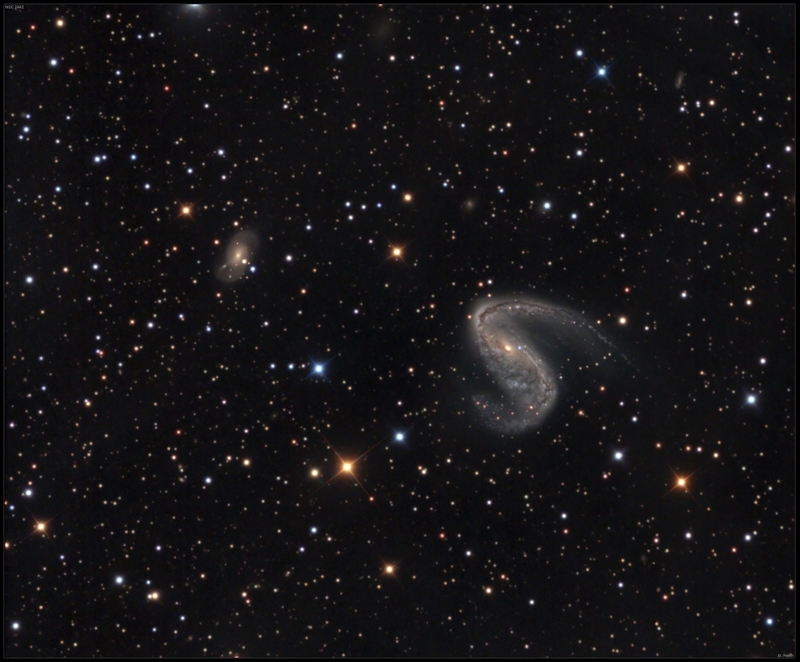 Here is an image of the interacting pair of galaxies NGC 1532/1 in Eridanus taken earlier this month. Some of its dwarf companion galaxies are also seen in the frame. It is an outlying member of the Fornax cluster of galaxies 60 million light years away. NGC 1532's strange appearance is due to tidal interaction with its close neighbour below it. Globular cluster NGC 1851 in Columba 27"CDK with FLI CCD. LRGB image. The small constellation of Columba isn't really one many stop by to explore being overshadowed by nearby Orion and Canis Major. The constellation does contain one often overlooked gem however. 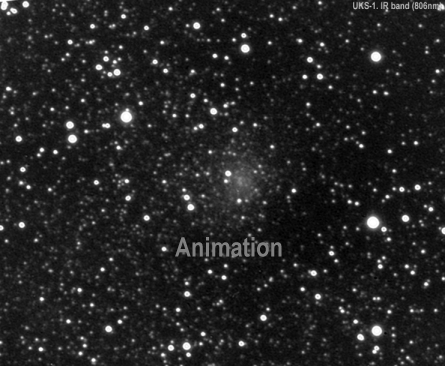 NGC 1851 was first catalogued way back in 1826 and is quite distant from us at 40,000 light years. Despite this it can still be seen in binoculars as a fuzzy patch on a good night, and small telescopes begin to show its true nature - a spherical cluster containing hundreds of thousands of stars. 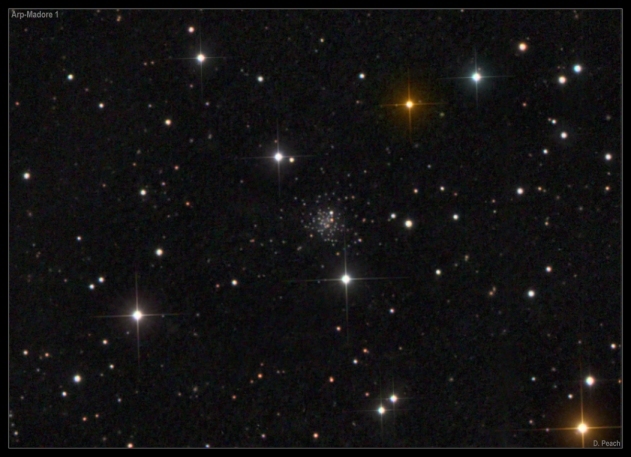 Globular cluster NGC 362 in Tucana 27"CDK with FLI CCD. RGB image. Often overshadowed by its brighter neighbour (47 Tucanae) NGC 362 is a pretty bright and impressive cluster in its own right. Shining at 7th magnitude it can be seen with the naked eye from very dark sites, and is an impressive sight in small telescopes. It is 27,000 light years away. 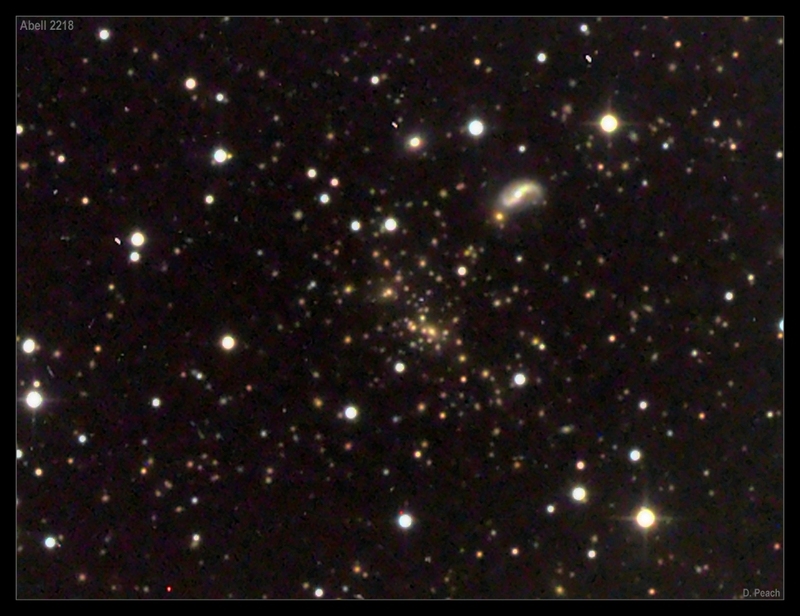 NGC 2442/3 is the distorted barred spiral at right (also more commonly known at the Meathook galaxy.) 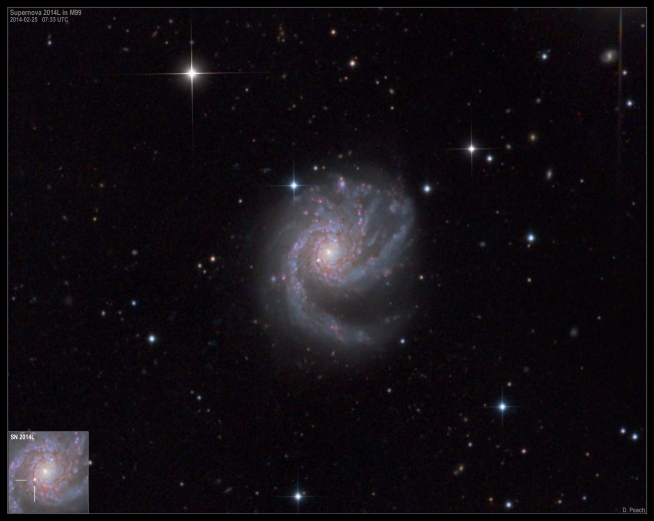 It actually has two NGC numbers despite being a single galaxy and also contains a large gas cloud devoid of stars. 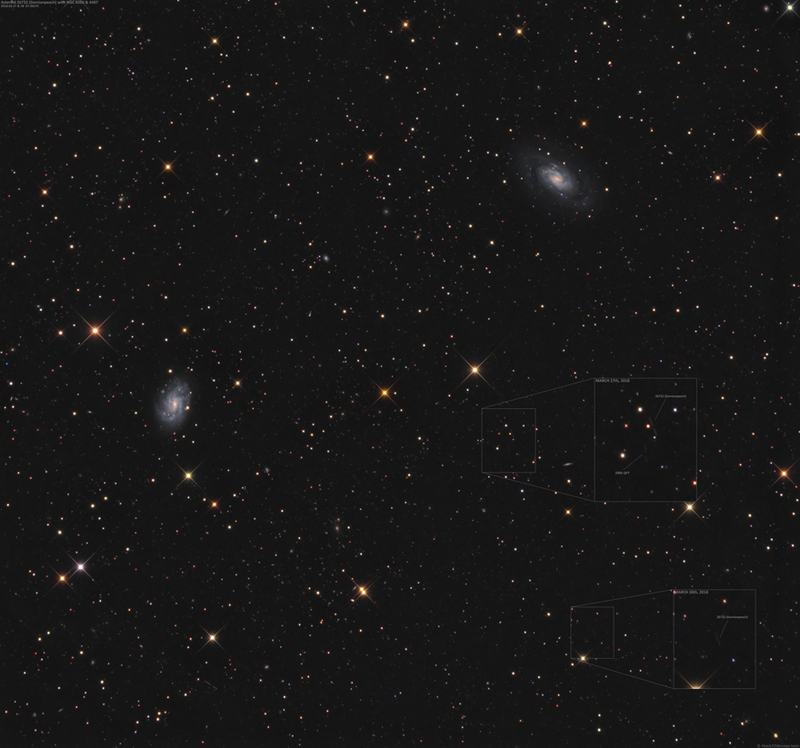 To the left is 13th magnitude spiral galaxy PGC 21457. Both galaxies are around 50 million ly away. 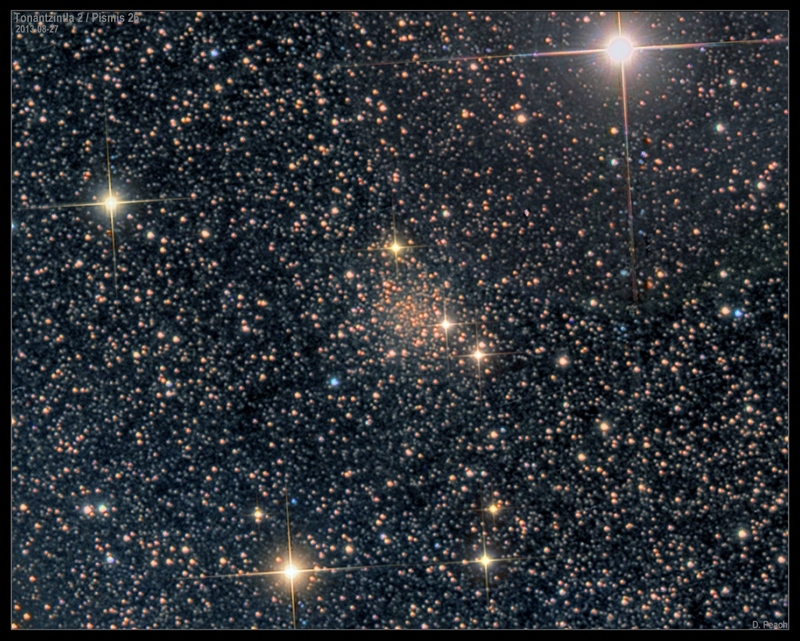 Open cluster NGC 2516 in Carina 20" CDK with FLI CCD camera. LRGB image. A bright open cluster in the southern constellation Carina. It is 1300 light years away. 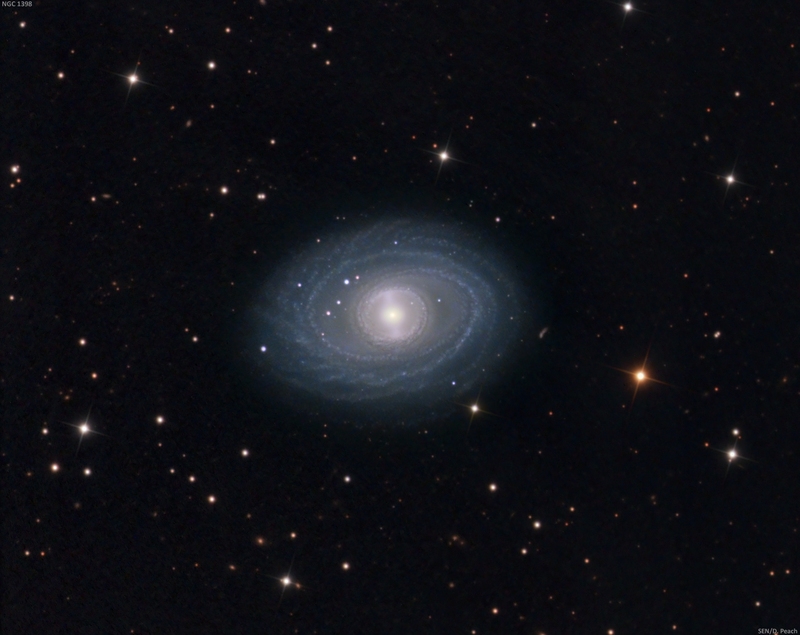 NGC 1398 in Fornax 27" CDK with FLI CCD camera. LRGB image. One of the brighter galaxies within the Fornax cluster of galaxies, this rather odd looking barred spiral galaxy is surrounded by very finely would spiral arms. It is around 65 million light years away and glows at 10th magnitude making is visible in small telelscopes. NGC 1232 in Eridanus 27" CDK with FLI CCD camera. LRGB image. One of the skies finest face on spiral galaxies and visible in small telescopes. This galaxy is around 65 million light years away. Note the small companion galaxy NGC1232A to the lower left of the main galaxy. NGC 253 in Sculptor 27" CDK with FLI CCD camera. LRGB image. One of the skies finest galaxies and visible in binoculars. This dusty glow is around 11 million light years away and actually consists of some 200 billion stars. It is also classed as a starbust galaxy as it is undergoing a period of intense star formation. It was first sighted by Caroline Herschel back in 1783. It contains a supermassive blackhole at its core thought to be around 5 million solar masses. The Cartwheel Galaxy 27" CDK with FLI CCD camera. LRGB image. Located in the southern constellation Sculptor, this ring galaxy was likely formed from a collision between two galaxies in the distant past. The blue ring of material is a region of active star formation dominated by hot blue stars. This ring of material is 150,000 light years in diameter which is larger than our own milky way galaxy. The Cartwheel Galaxy is 500 million light years away and glows dimly at 15th magnitude. It is also very small in angular size being only 1.2 arc mins in size. Hind's Crimson Star 20"CDK @ F6.8. FLI camera. RGB image. 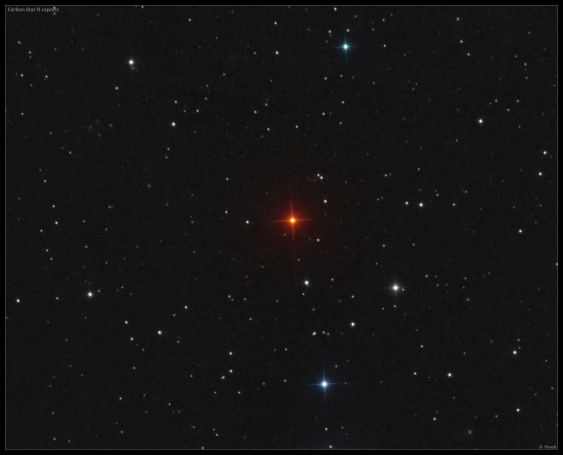 This spectacular object is a candidate for the reddest star in the sky. The image presented here has had no extra colour saturation applied - this is a true colour RGB image. Discovered by astronomer J.R. Hind in 1845, he described it thus "like a drop of blood on a black field." 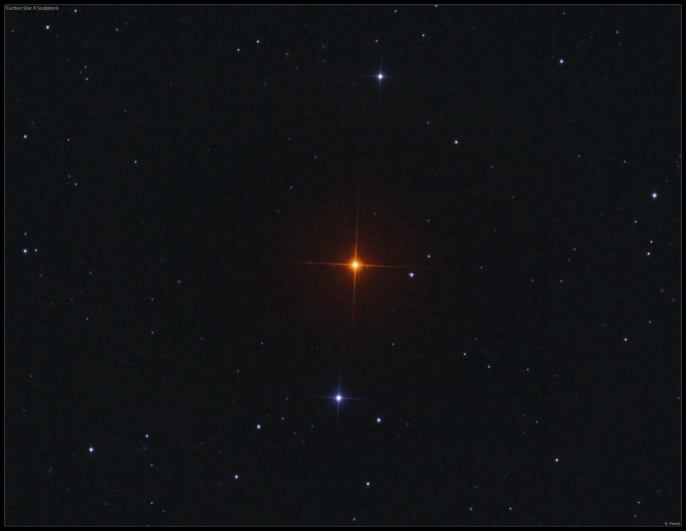 The star itself is a carbon star like R Sculptoris seen below but even more striking in its colour. It is 1300 light years away and is also varies in brightness. I also present an animation showing the striking difference between how the star appears in R and B filters. The difference is staggering. Note how the other stars in the field change very little. This is due to the huge amounts of carbon in the stars outer atmosphere filtering out the blue part of the spectrum. 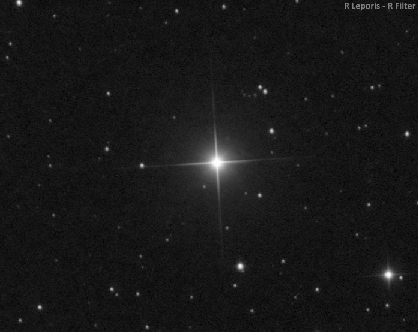 Carbon Star R Sculptoris 27"CDK @ F6.8. FLI camera. RGB image. This is a straight RGB image to really show the star colours well. 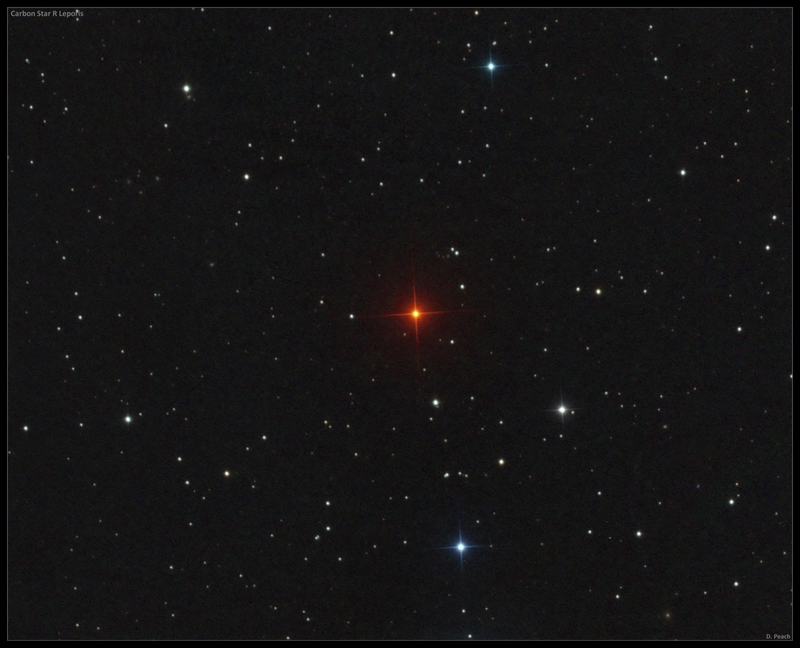 I was quite amazed how just how deeply coloured this star appeared even in the raw images. 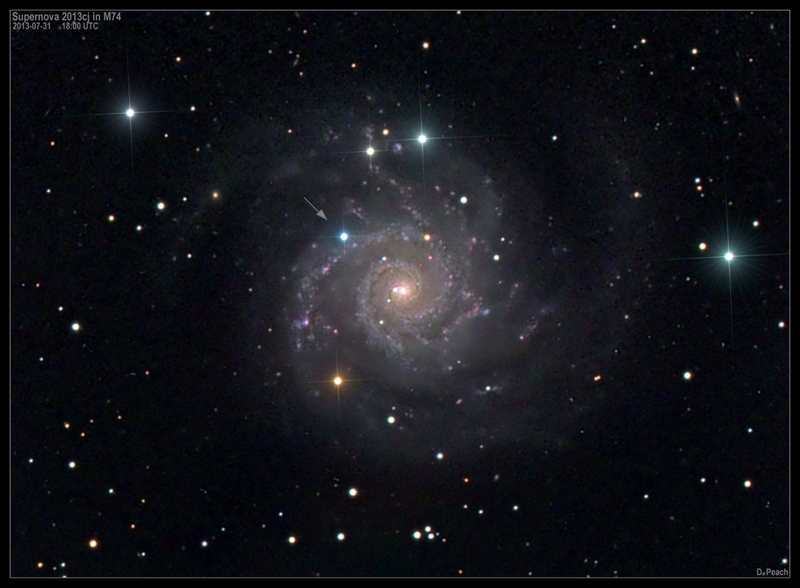 Radio Galaxy Fornax A (NGC 1316) 27"CDK @ F6.8. FLI camera. LRGB image. Centre of the Milkyway 27"CDK @ F6.8. FLI camera. IRRGB image. Spitzer/Chandra/HST inset. Sgr A* - Location of 4.3million solar mass black hole at the centre of the galaxy. It is 26,000 light years away. Arches cluster - Cluster of highly luminous stars millions of times brighter than our Sun. V4998 Sag - Highly luminous star of 4 million times solar luminosity. It radiates as much energy in 10 seconds as the Sun does in a year. Peony Star & Nebula - Another highly luminous star almost 4 million times brighter than the sun. The Eagle Nebula "Pillars of creation" 27"CDK @ F6.8. FLI camera. LHaRGB image. This bright nebula in the constellation Serpens is one of the most impressive in the night sky. Easily seen in small telescopes as a faint misty patch surrounding a cluster of stars. Large scope however show fascinating detail within the nebula. 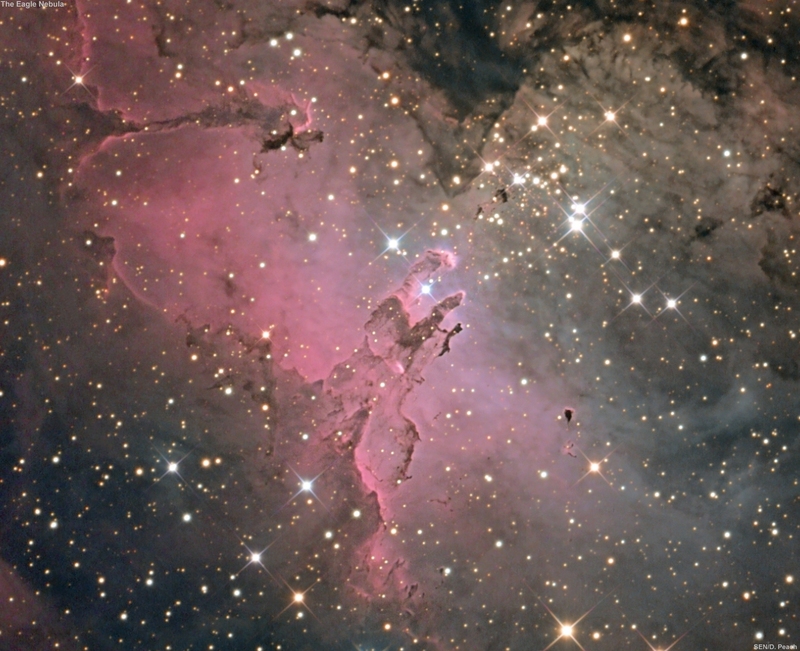 The dark pillars of dust (made most famous by the 1995 HST image of this features dubbed the Pillars of Creation) are region were stars are being born. The bright star cluster within the nebula our themselves very young - only 1-2 million years old. The whole complex is located around 7000 light years away. 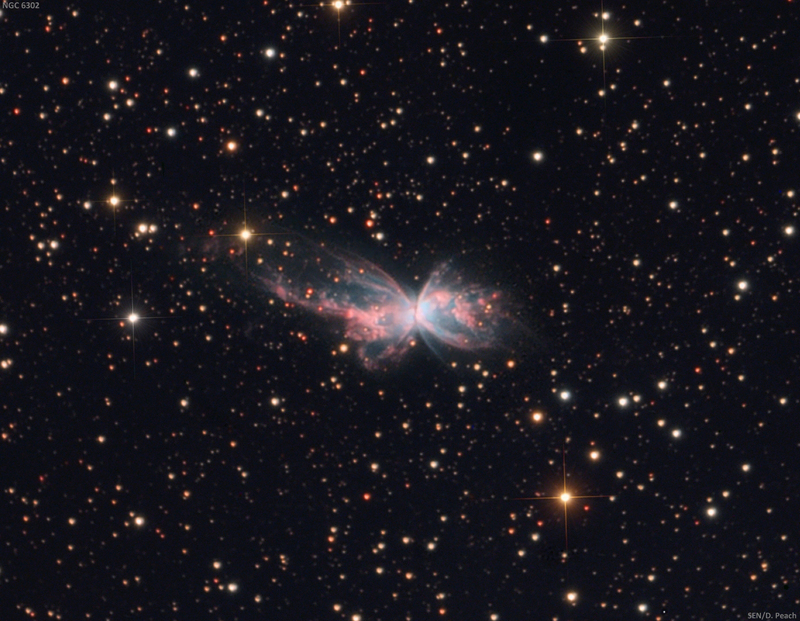 The Butterfly Nebula (NGC 6302) 27"CDK @ F6.8. FLI camera. LHaRGB image. This beautiful bi-polar planetary nebula is located in southern Scorpius and although fairly bright at 10th magnitude its small angular size (about 80 x 45 arc secs) makes it challenging to get good detail in. The central white dwarf star is one of the hottest known, with the surface temperature of 200,000K. 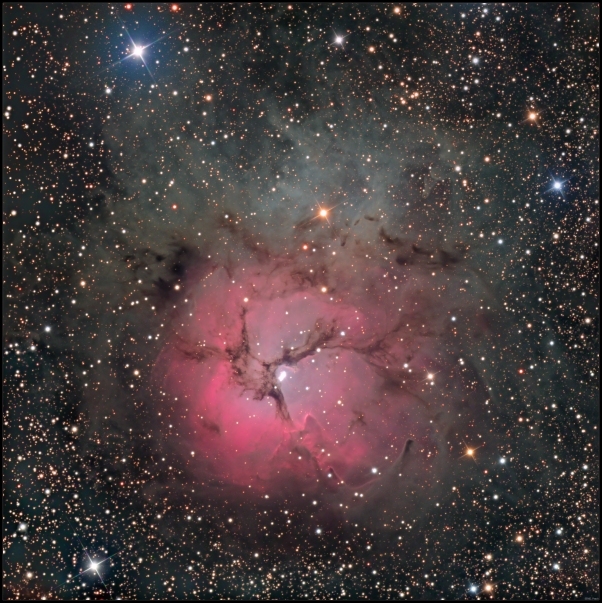 The Trifid Nebula 27"CDK @ F6.8. FLI camera. L: 60mins. RGB: 15mins. This famous object is an unusual combination of an open cluster of stars; an emission nebula (the lower, red portion), a reflection nebula (the upper, blue portion) and a dark nebula (the apparent 'gaps' within the emission nebula that cause the trifurcated appearance) It is located around 5000 light years away. 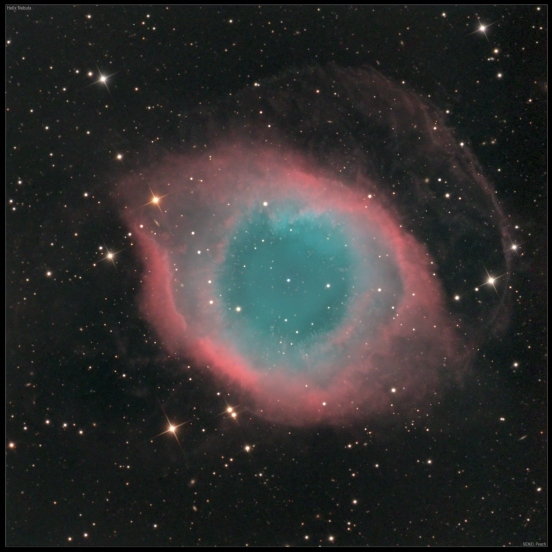 The Helix Nebula 27"CDK @ F6.8. FLI camera. L: 90mins. RGB: 5mins. One of the brightest planetary nebulae in the sky. It is located around 700 light years away and spans around 2.5 light years in size. 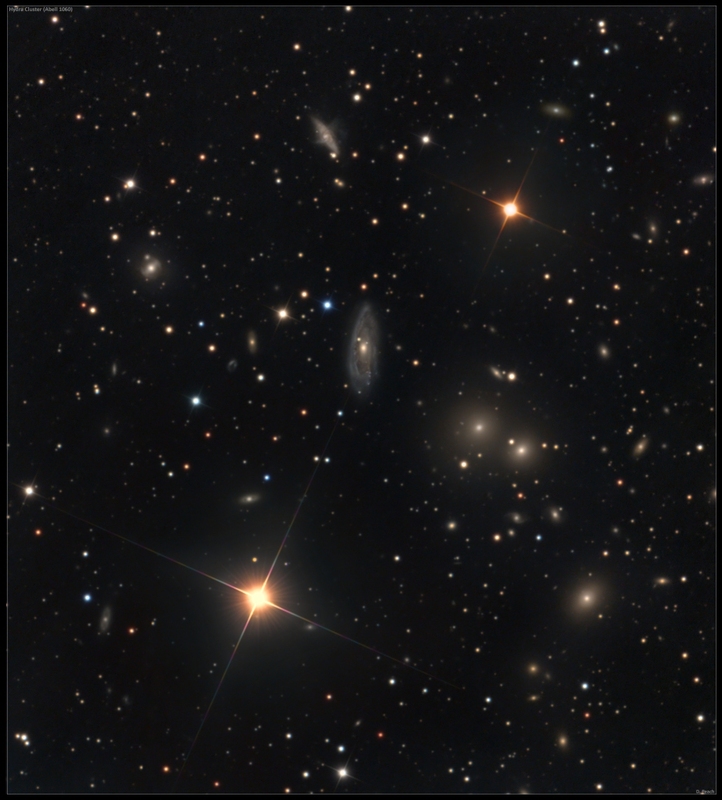 Many background galaxies are visible in the image (which are vastly more distant) including some visible through the nebula itself. Planetary nebulae such as this one represent the very late stages of low-medium mass stars (such as the Sun.) Indeed the Sun itself will one day create a planetary nebula perhaps similar to the Helix, billions of years from now. 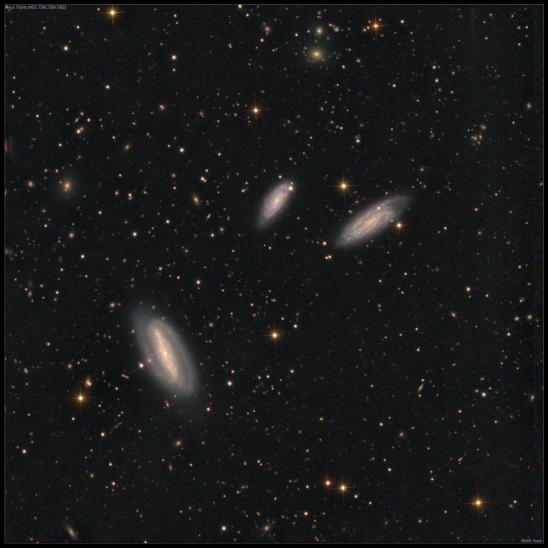 The Grus Triplet 27"CDK @ F6.8. FLI camera. L: 60mins. RGB: 5mins. This group of galaxies is located in the southern constellation of Grus and consists of three close spiral galaxies - NGC 7582, 7590 and 7599 located around 60 million light years away. The field also contains hundreds of more distant galaxies, many of them over a billion lights years away. 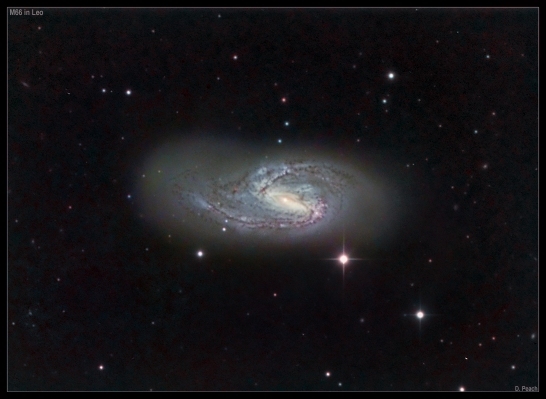 Spiral Galaxy NGC 2997 27"CDK @ F6.8. FLI camera. L: 60mins. RGB: 5mins. This face on spiral galaxy is located in the southern constellation of Antlia. It is 50 million light years away and glows at 10th magnitude. It can be easily seen in small telescopes. 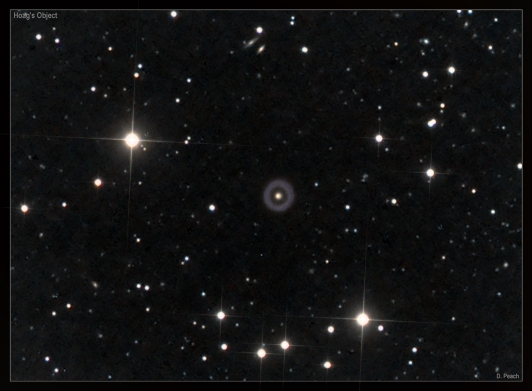 Planetary nebula Shapley 1 27"CDK @ F6.8. FLI camera. L: 60mins. RGB: 5mins. 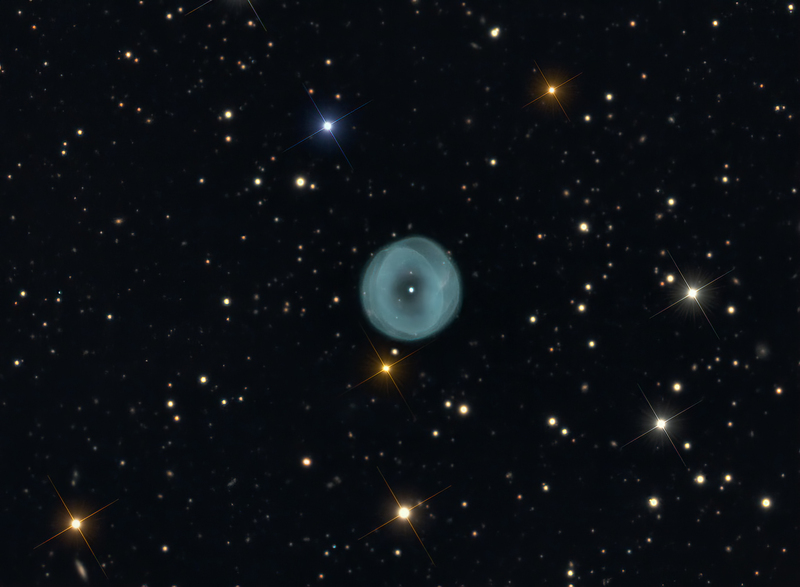 Shapley 1 (Sp 1 or PLN 329+2.1) is an annular planetary nebula in the constellation of Norma with a magnitude of +12.6. As viewed from Earth, it is peculiar in that it seems to be a non-bipolar, torus-shaped planetary nebula. Discovered in 1936 by Harlow Shapley, it is approximately 1,000 light years from Earth. At the centre of the nebula is a magnitude 14 white dwarf star.It has an angular diameter of 1.1 arc minutes,which makes it about one-third (.32) of a light year across. 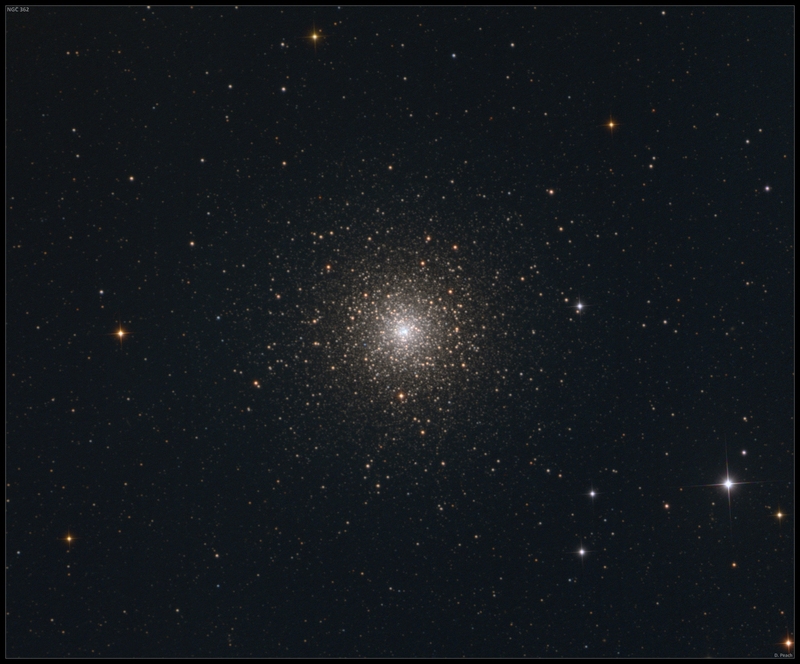 Globular cluster 47 Tucanae (NGC 104) 20"CDK @ F4.5. FLI camera. RGB: 45mins. Possibly the finest globular cluster in the entire sky. 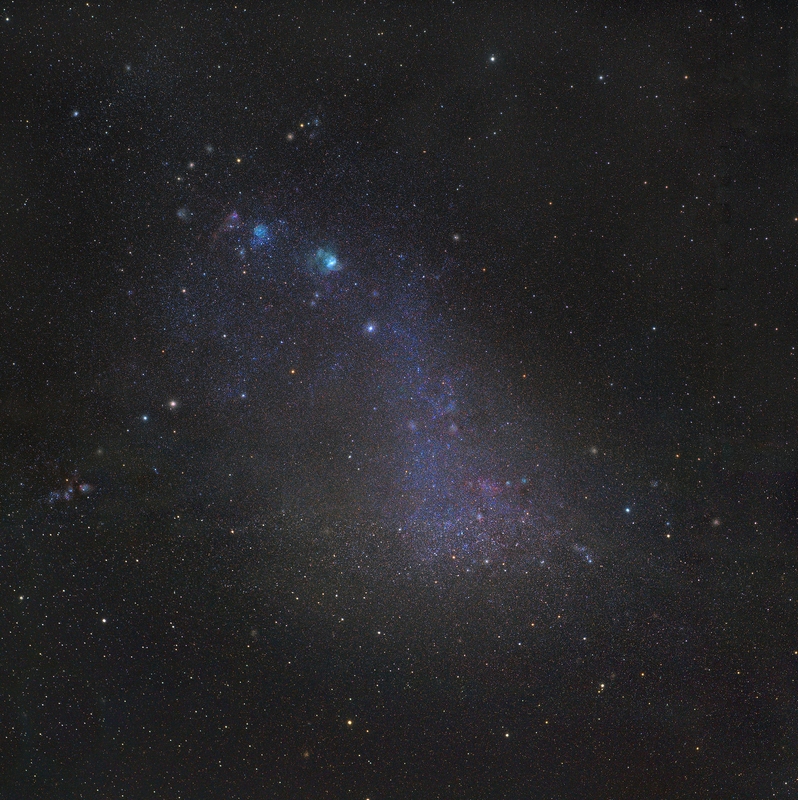 Visible to the naked eye alongside the Small Magellanic Cloud, the massive ball of stars is 16,700 light years away from our solar system and is 120 light years in diameter. 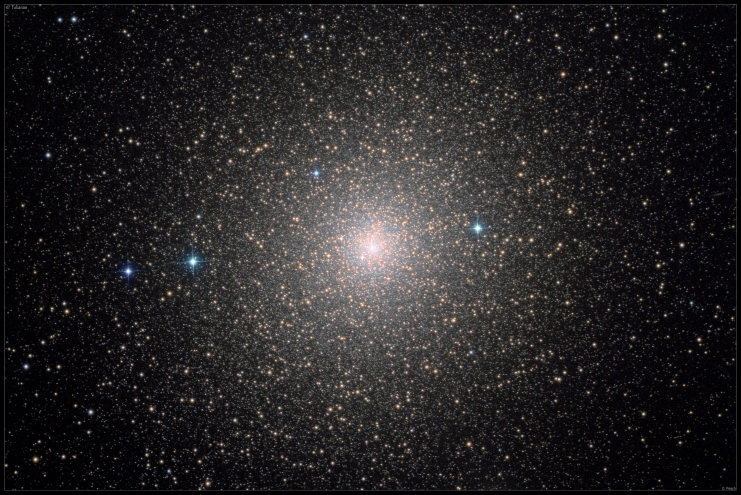 Unlike Omega Centauri (the skies bright cluster of this type) 47 Tucanae is much denser toward the core giving the cluster a "3D" appearance in the telescope. Planetary nebula IC 5148 in Grus 27" CDK@F6.8. FLI camera. L:60mins. RGB: 5mins. Nicknamed the Spare-tyre nebula,IC 5148 is a planetary nebula located around 1 degree west of Lambda Gruis in the constellation of Grus. Around 3000 light-years distant, it is expanding at a rate of 50 kilometres a second, one of the fastest expansion rates of all planetary nebulae. Heavily obscured by intervening dust it only visible in IR (image details below.) 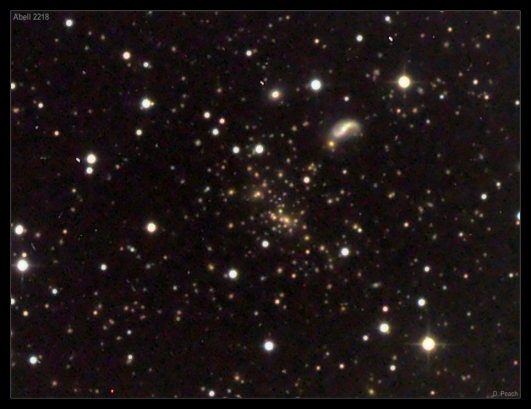 This image clearly showing the cluster which was only discovered as recently as 2006. It is 31000 l.y. away and contains around a hundred thousand stars. It is located in Ara amongst the dense star clouds of the Milkyway. To my knowledge this may be the first time this has been imaged with amateur equipment. 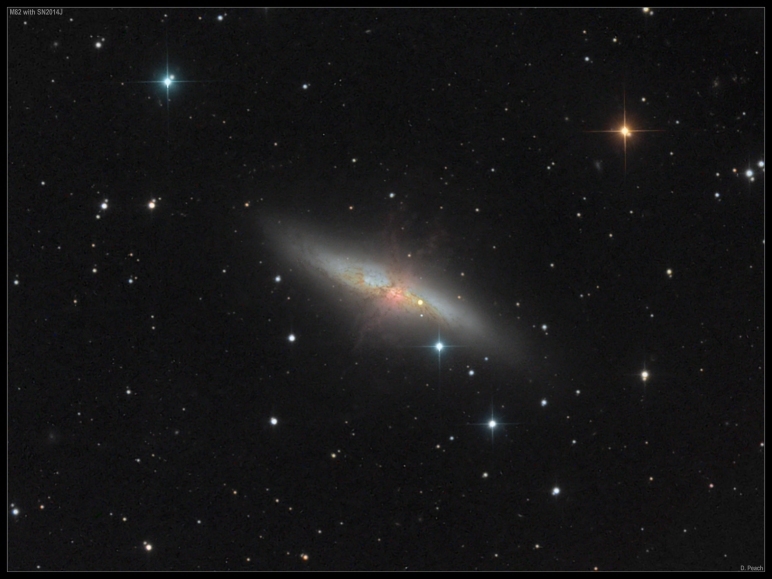 Messier 82 is an active starburst galaxy 12million light years away in the constellation Ursa Major. Back in late January a new star was discovered in this galaxy (from right here in the UK at UCL.) This star (seen here as the prominent orange coloured star just right of the galaxy centre) is the result of a type 1a supernova explosion. This is the nearest and brightest such event to have been seen in some time and is easily visible in small telescopes. Just to give some idea of how staggering these stellar explosions are, the amount of energy released in a typical supernova is the roughly the same as the amount of energy that our Sun will produce over its entire 10 billion year life span. 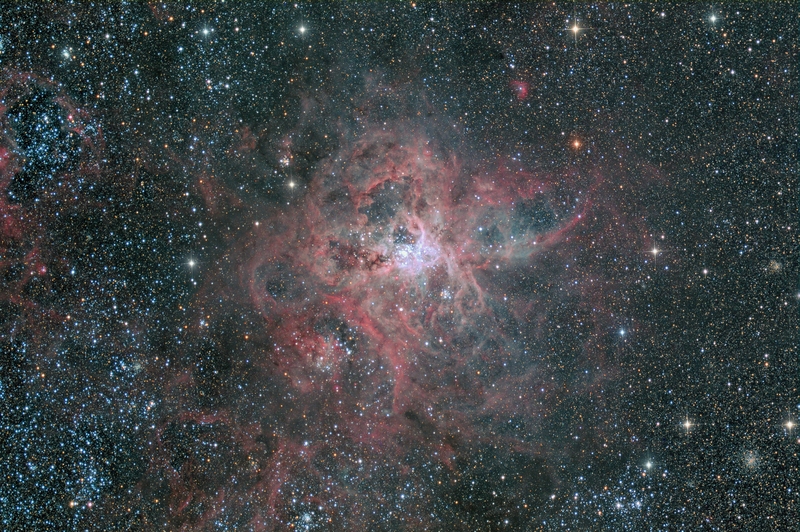 The Tarantula Nebula 20" Planewave CDK. FLI camera. LRGB. L: 1.5hrs. RGB: 15mins. This object is one ive loved ever since i first saw photo's of it back as a young boy. The Tarantula Nebula is one of the skies most impressive nebulae. Located 160,000 light years away in the Large Magellanic Cloud (a small nearby galaxy.) It is the most active star forming region in the local group of galaxies and is more than 600 light years in diameter. If it were as close to us as the famous Orion Nebula (1500 light years) the Tarantula would cast shadows! NASA APOD Feb 17th, 2014. Globular cluster Arp-Madore 1 20" Planewave CDK. FLI camera. LRGB. L: 60mins. RGB: 15mins. This remote globular cluster in the constellation of Horologium presently holds the record as the most distant globular cluster bound to the Milkway galaxy. Its located more than 400,000 light years away making it some 25 times more distant than Omega Centauri (the largest and brightest globular cluster.) Being only 16th magnitude it is only visible in large telescopes. 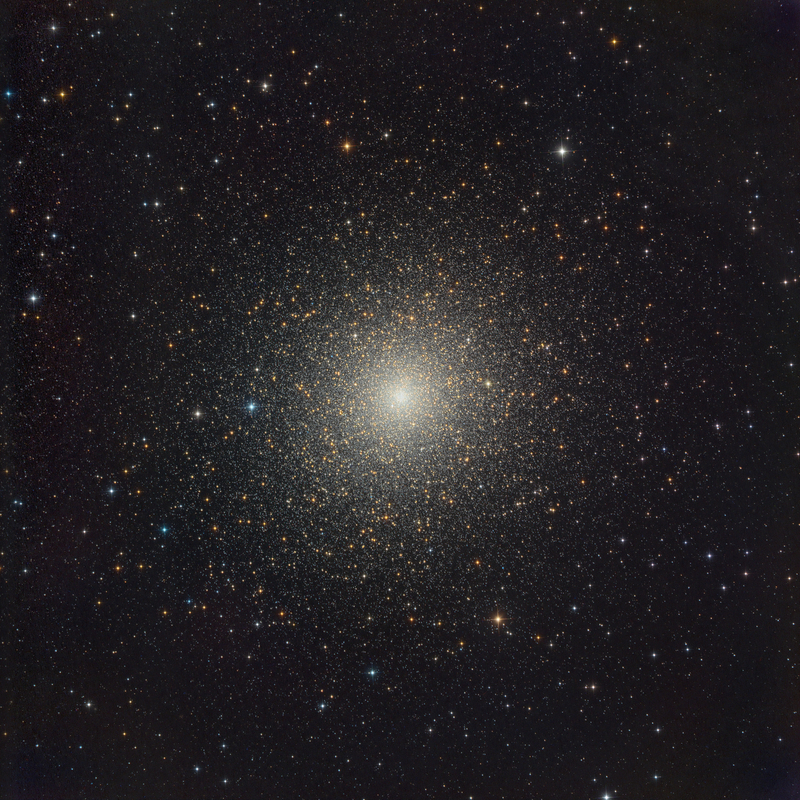 It was only identified as a globular cluster in 1979 on photographic plates from the UK Schmidt Telescope at Siding Spring Observatory. 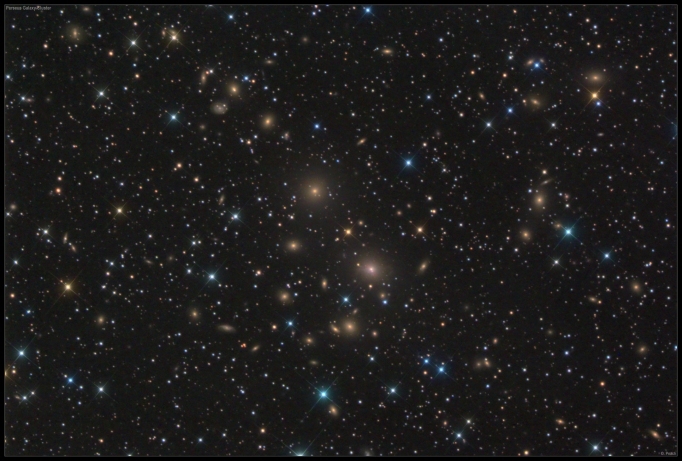 The Perseus Galaxy Cluster 12.5" CDK with SBIG 6303E camera. LRGB. L: 45mins. RGB: 5mins. This large cluster of galaxies known as Abell 426 is located around 240 million light years away. 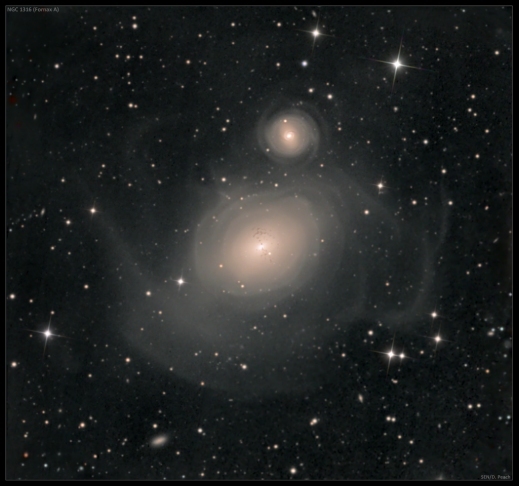 The brightest member of the cluster is the large elliptical galaxy NGC 1275 (seen just below and to the right of centre.) This galaxy is a source of strong x-ray emission most likely caused by the presence of a super massive black hole in the centre of the galaxy. The cluster is reseeding from us at a phenomenal speed - over 5000km per second. 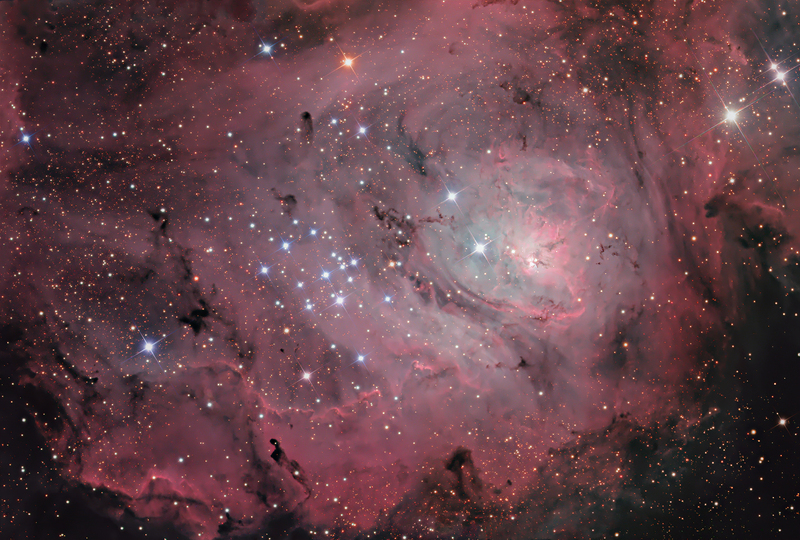 The brightest members of the cluster can be seen in modest amateur telescopes. The Cartwheel Galaxy 20" CDK with FLI-PL6303E camera. LRGB. L: 60mins. RGB: 5mins. Located in the southern constellation Sculptor, this collisional ring galaxy was likely formed from a collision between two galaxies in the distant past. 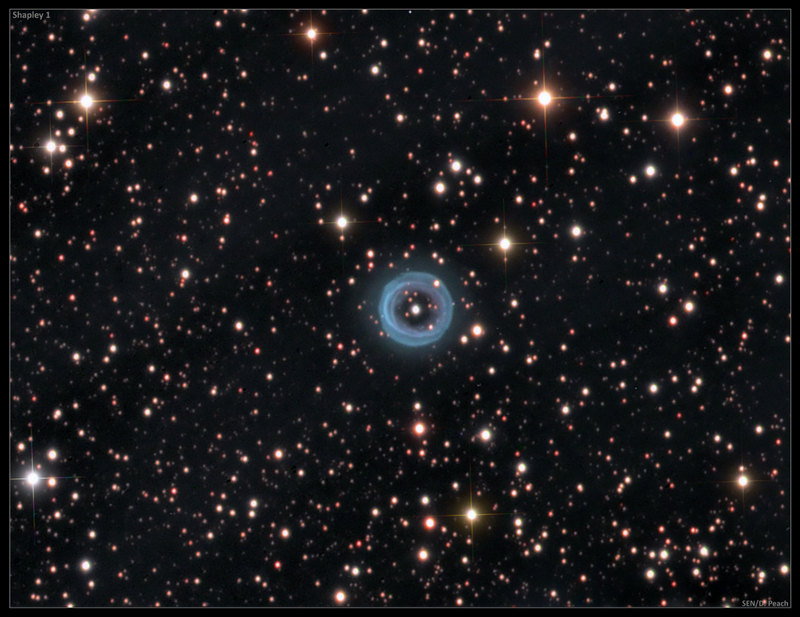 The blue ring of material is a region of active star formation dominated by hot blue stars. This ring of material is 150,000 light years in diameter which is larger than our own milky way galaxy. The Cartwheel Galaxy is 500 million light years away and glows at 15th magnitude. Fornax Galaxy Cluster. 106mm F5.0. STL-11k camera. L:60mins. RGB: 5mins. August 2013. 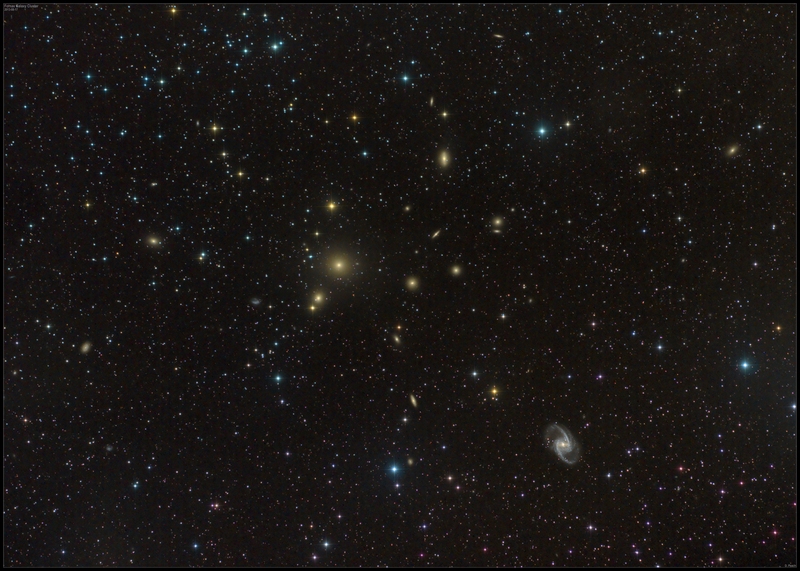 One of the closer galaxy clusters to us at 60 million light years the Fornax cluster contains around 60 galaxies of various types from large elliptical galaxies such as NGC 1399 to lovely spiral galaxies such as NGC 1365 seen at lower right. 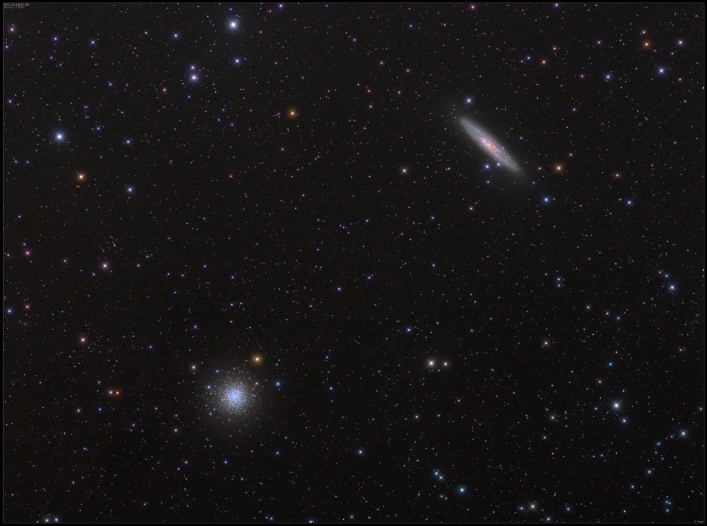 Some of the galaxies seen here are bright enough to be seen in small telescopes. NGC 1365 has been home to four observed Supernovae the most recent having occurred in 2012. 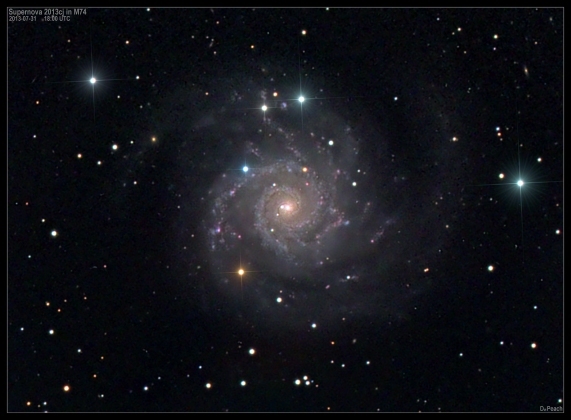 Spiral Galaxy NGC 6744. 20" CDK@F4.5. FLI camera. L:120mins. RGB: 20mins. March 2013. Collaboration with Ian Sharp. 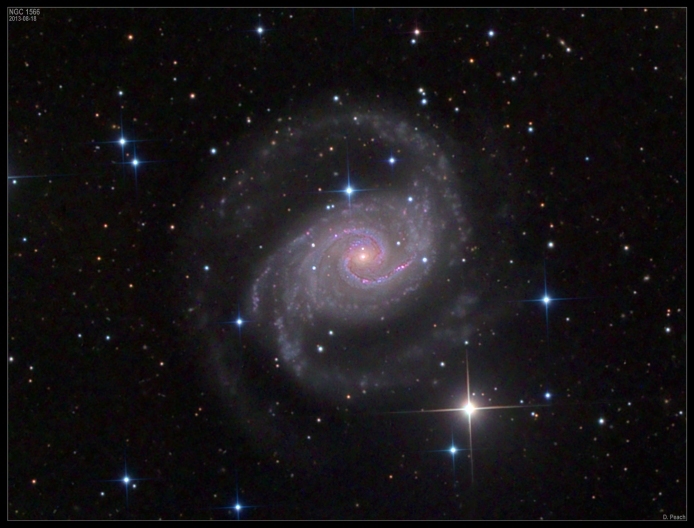 This beautiful spiral galaxy is located in the southern constellation of Pavo and is thought to closely resemble how our own Milkyway may look if we could view it from afar. NGC 6744 however is thought to be around twice the size of our own galaxy. It is 30 million light years away and is visible in binoculars as a small fuzzy patch of light. 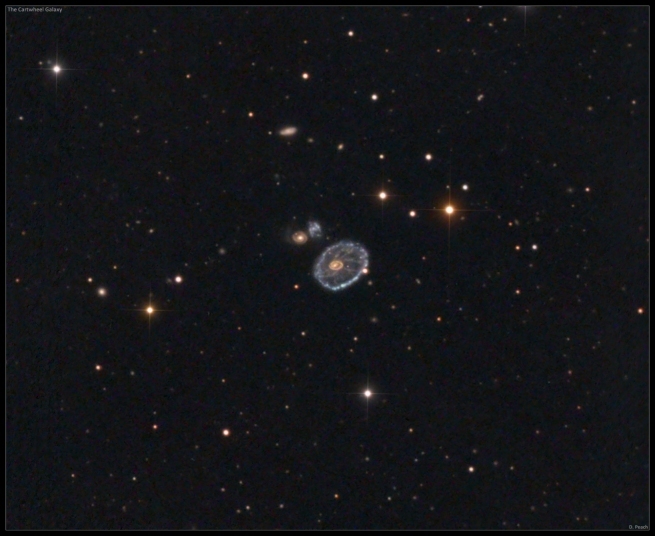 Ring galaxy AM0644-741 in Volans 20" CDK with FLI-PL6303E camera. LRGB. L: 8x5mins. RGB: 5/5/10mins. Located in the far southern constellation Volans this ring galaxy was likely formed from a collision between two galaxies in the distant past. 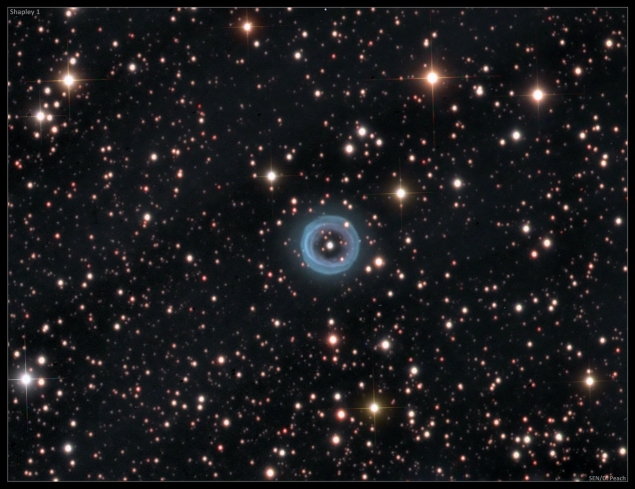 The blue ring of material is a region of active star formation dominated by hot blue stars. This ring of material is 150,000 light years in diameter which is larger than our own milky way galaxy. AM0644-741 is 300 million light years away and glows at 14th magnitude. Ring galaxy NGC 1291 in Eridanus 20" CDK with FLI-PL6303E camera. LRGB. L: 12x5mins. RGB: 5/5/10mins. 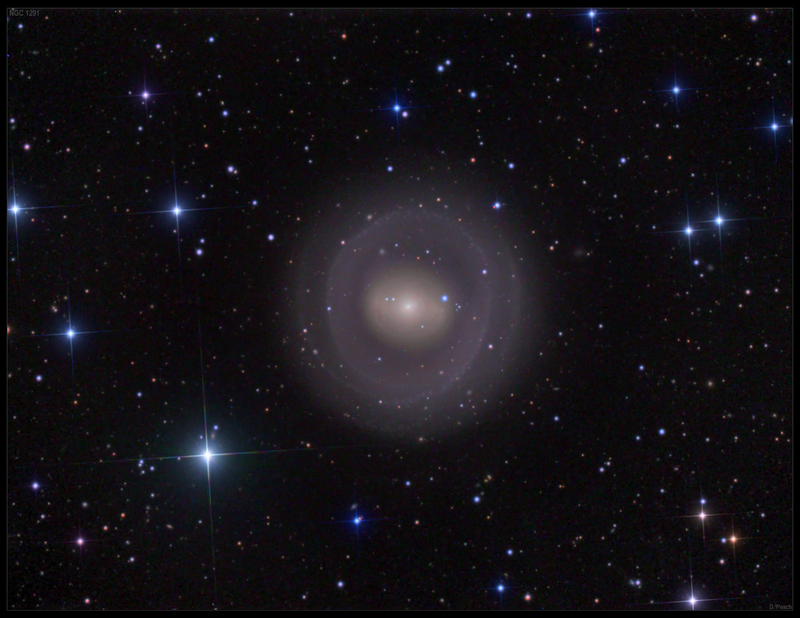 The bizarre looking ring galaxy NGC 1291 in Eridanus. These fairly rare types of galaxy are usually much fainter objects, but this one at "only" 33 million light years away is easily visible in modest size telescopes though the faint outer ring of material is much fainter than this. Its strange appearance is the likely the result of a collision with another galaxy in the distant past. Globular cluster Tonantzintla 2 / Pismis 26 Luminance: 17"CDK with FLI-PL4710 camera. 30 x 1mins in IR806nm. RGB: 20" CDK with FLI-PL6303e camera. Each 1x5 mins in RGB filters. Here is an IR based colour image of the heavily obscured Milkyway globular cluster Tonantzintla 2 in Scorpius. It is just 4000 ly from the centre of the galaxy and discovered in 1959 from the Tonantzintla Observatory in Mexico by astronomer Paris Pismis. The image was obtained through two telescopes - the luminance data being centred at 806nm to help penetrate the obscuring dust in our galaxy. Spiral Galaxy NGC 1566 in Dorado 20" CDK with FLI-PL6303E camera. LRGB. L: 10x5mins. RGB: 1x5mins. A little know spiral galaxy in the obscure southern constellation of Dorado. 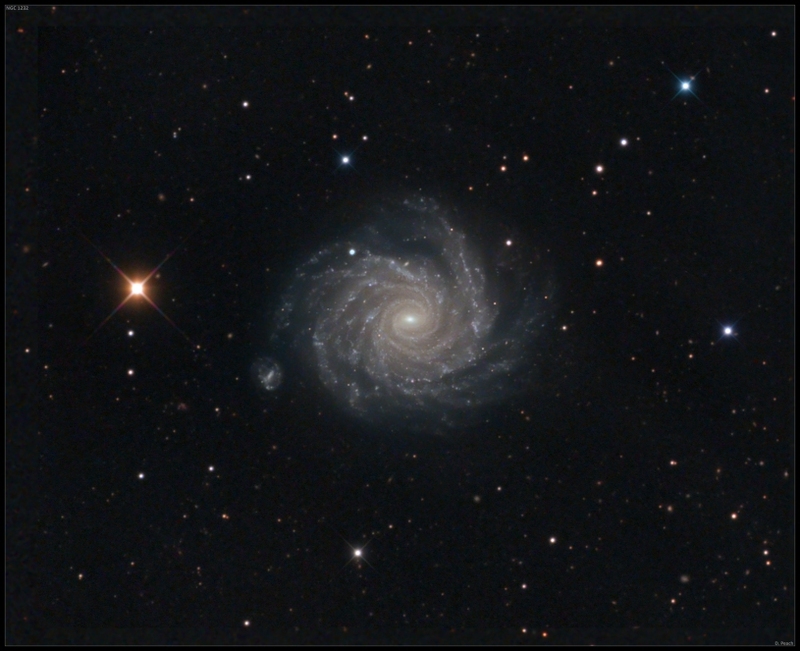 It the skies second brightest Seyfert galaxy behind M77. It is located 38 million light years away and at 10th magnitude is easily visible in small telescopes. A supernova appeared in this galaxy back in 2010. 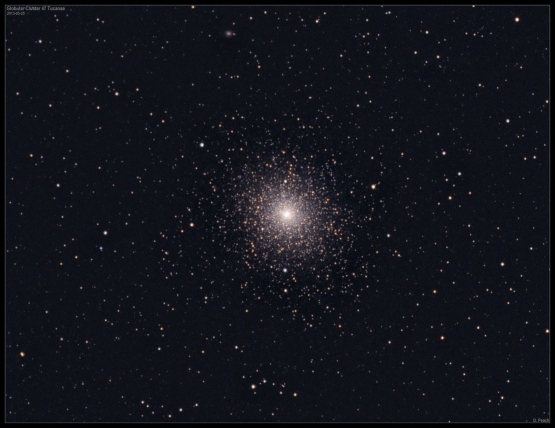 Globular cluster NGC 1261 in Horologium 20" CDK with FLI-PL6303E camera. LRGB. L: 8x3mins. RGB: 1x3mins. Discovered by James Dunlop in 1826, this 8th magnitude globuar cluster is located 53,000 light years away. It is located in the obscure southern constellation of Horologium and is often overlooked. Despite this it is easily visible in small telescopes. 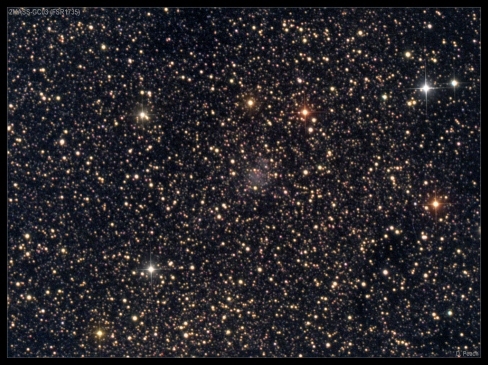 Globular cluster NGC 288 and spiral galaxy NGC 253 FSQ106 with STL-11000M. LRGB. L: 25mins. RGB: 3mins. A lovely pairing among the stars of the southern constellation of Sculptor. 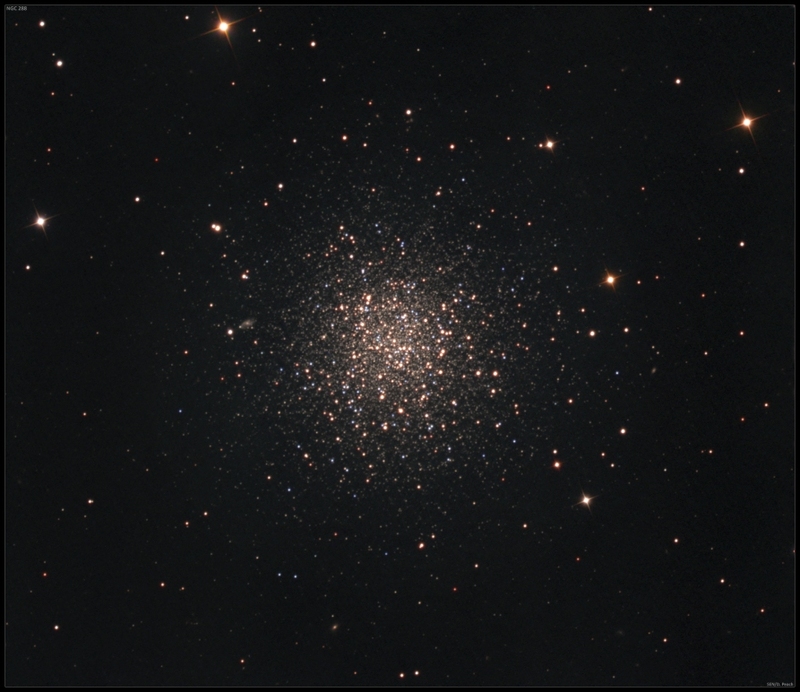 NGC 288 is a globular cluster some 29,000 light years away and easily visible in small telescopes. 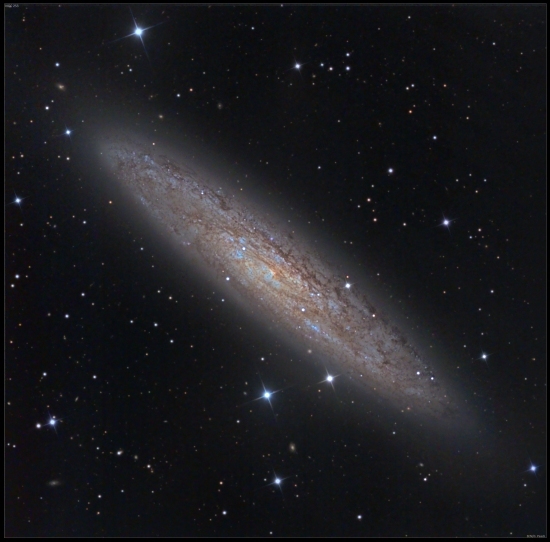 NGC 253 is a bright spiral galaxy highly inclined to our line of sight. It is visible in binoculars and is without doubt one of the skies finest galaxies. It is far more distant being around 11 million light years away. 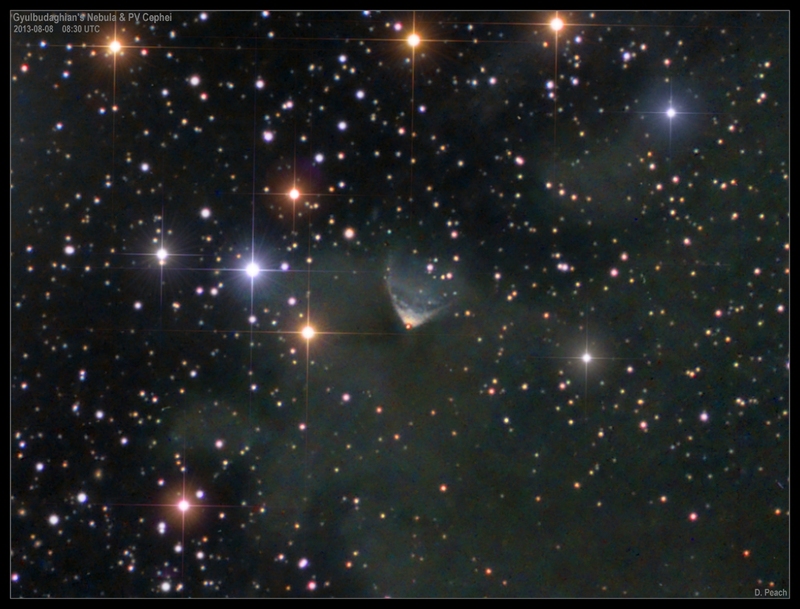 Gyulbudaghian's Nebula in Cepheus 17" CDK with FLI-PL6303E camera. LRGB. L: 8x3mins. RGB: 1x3mins. This highly variable bi-polar nebula emanates from the young proto star PV Cephei (which can be seen as the red star at the apex of the nebula.) It is one of the few nebulae which can change dramatically in appearance over fairly short time scales and the star itself can change dramatically in brightness. The nebula is generated by shockwaves from PV Cephei and the star itself can undergo dramatic changes in brightness. 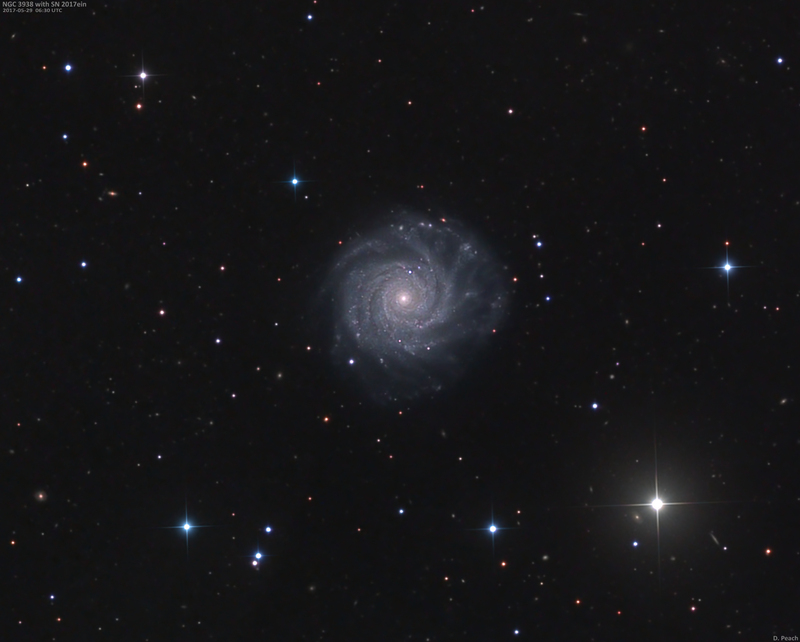 Spiral galaxy M74 in Pisces 17" & 20" CDK with FLI-PL6303E camera. LRGB. L: 8x3mins. RGB: 1x3mins. 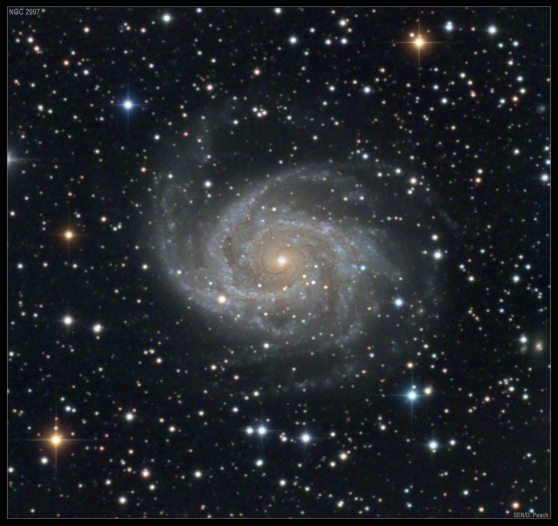 Messier 74 is a fairly bright spiral galaxy located in Pisces. Its low surface brightness however make it a rather unimpressive object in all but larger telescopes. It is 32 million light years away making it a fairly nearby galaxy in astronomical terms. 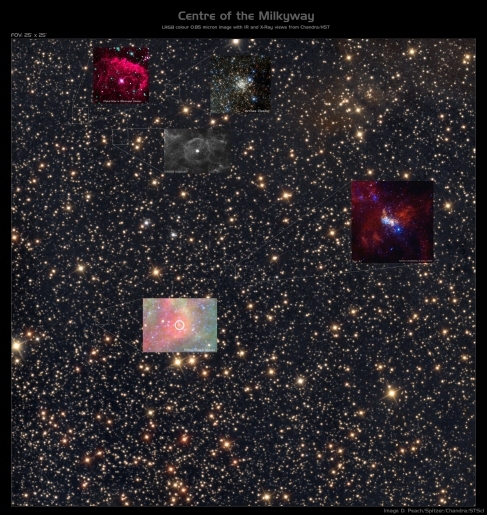 In the above images a bright supernova (2013ej) is present. Despite the stars great distance it manages to shine at a respectable 12th magnitude. The other bright stars in the image are much closer foreground stars in our own galaxy. Globular cluster UKS-1 in Sagittarius 17" CDK @ f6.8 with FLI-PL4710 camera. LRGB. L=IR806nm 10 x 2mins. RGB: 1 x 3mins. Clear filter image in the animation represents the view in visible light and was taken as part of this sequence. 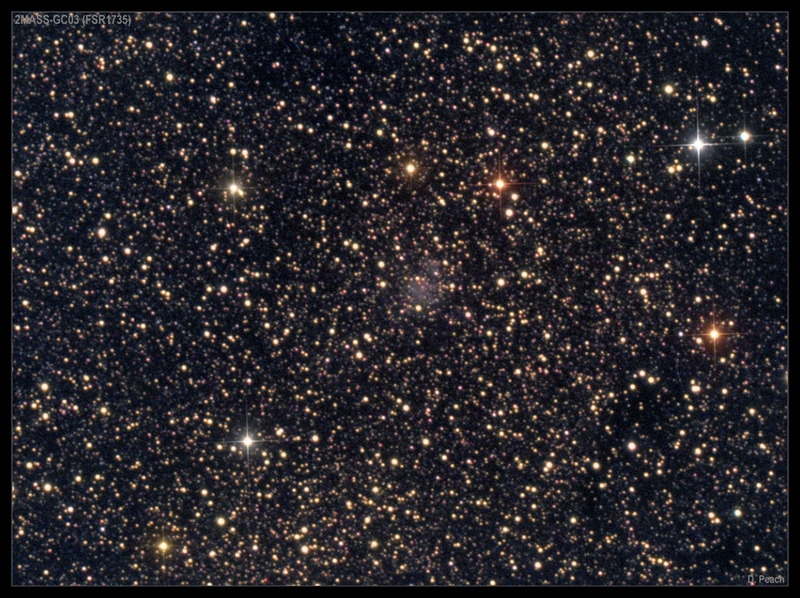 Here is an image and animation of the little known globular cluster UKS-1 in Sagittarius. This cluster is heavily obscured by dust in our galaxy and as such was not discovered until 1980 on IR photographic plates taken with the UK Schimidt Telescope at Siding Spring. The colour image presented is an LRGB with the luminance being an 806nm IR filtered image. I also present an animation showing the field imaged in a clear luminance filter centered in yellow-green light. Note how the cluster vanishes completely at this wavelength. UKS-1 is located around 25,000 light years away. 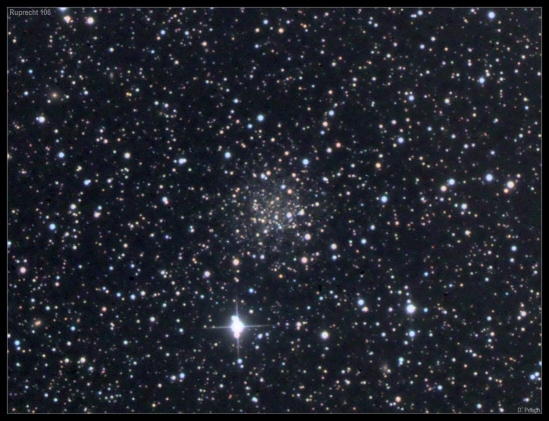 Globular cluster NGC 6752 in Pavo 20" CDK with FLI-PL6303E camera. LRGB. L: 6x3mins. RGB: 1x3mins. The third brightest globular cluster in the sky it is visible to the naked eye from reasonably dark sites. It is 13,000 light years away and a beautiful sight even in small telescopes. 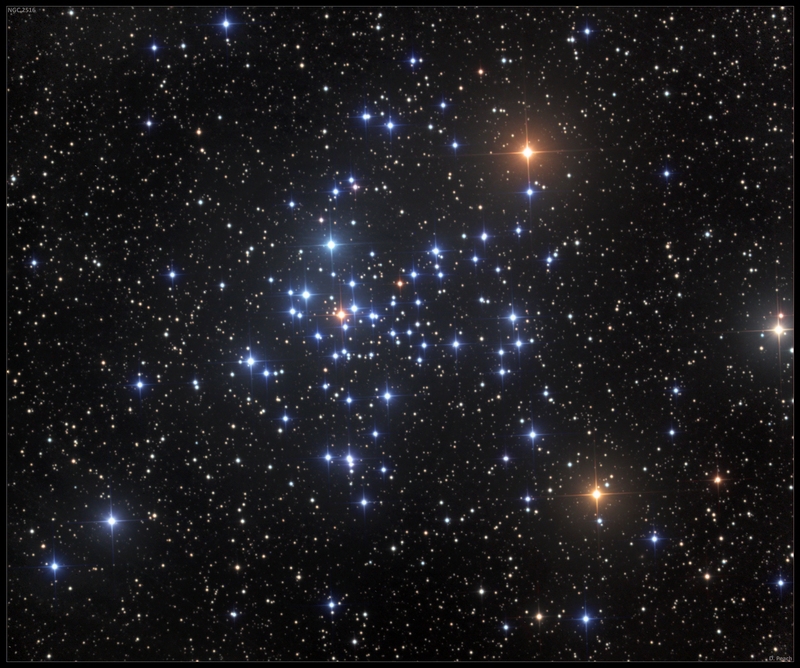 A multitude of different coloured stars are visible throughout the cluster. This image featured as NASA's Astronomy picture of the day. The Small Magellanic Cloud (SMC) FSQ106 with STL-11000M camera. 3 image mosaic LRGB:L: 5 x 3mins. RGB: 1x3mins. Bright moonlight. This small irregular galaxy located in the southern constellation of Tucana is one of the nearest galaxies to our own. It is around 200,000 light years away and 7000 light years in diameter. Many bright star clusters and nebulae are visible within the galaxy as well as countless individual stars. It is easily visible to the naked eye looking rather like a small detached portion of the Milkyway galaxy. Globular cluster 47 Tucanae (NGC 104) 20"CDK @ F4.5. FLI-PL6303E camera. L: 24 x 1mins. RGB: 1x2mins. Globular cluster NGC 104 (47 Tucanae) 106mm refractor with STL-11000M camera. RGB. 4x3mins each filter. Moon present. 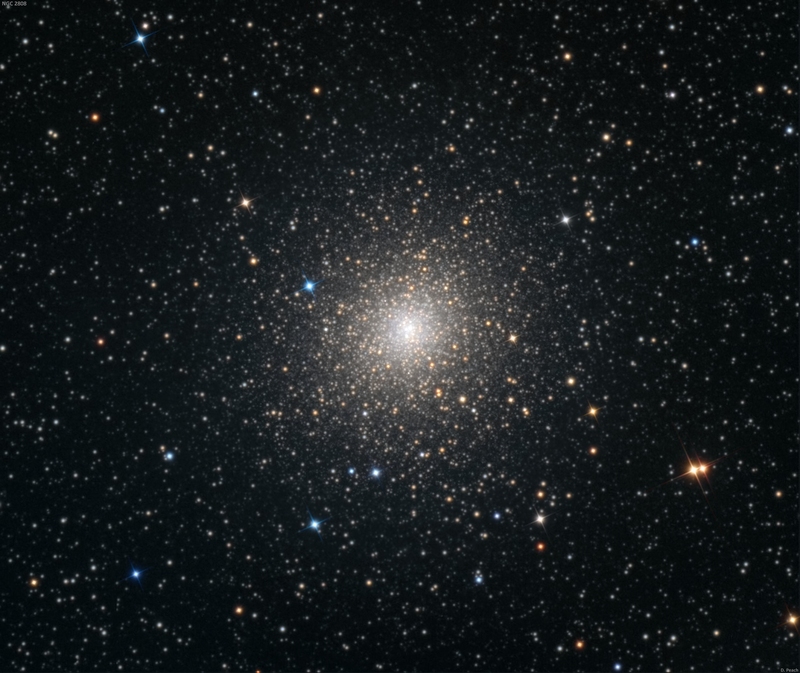 Probably the most spectacular globular cluster in the night sky, 47 Tucanae is a wonderful sight in any telescope. 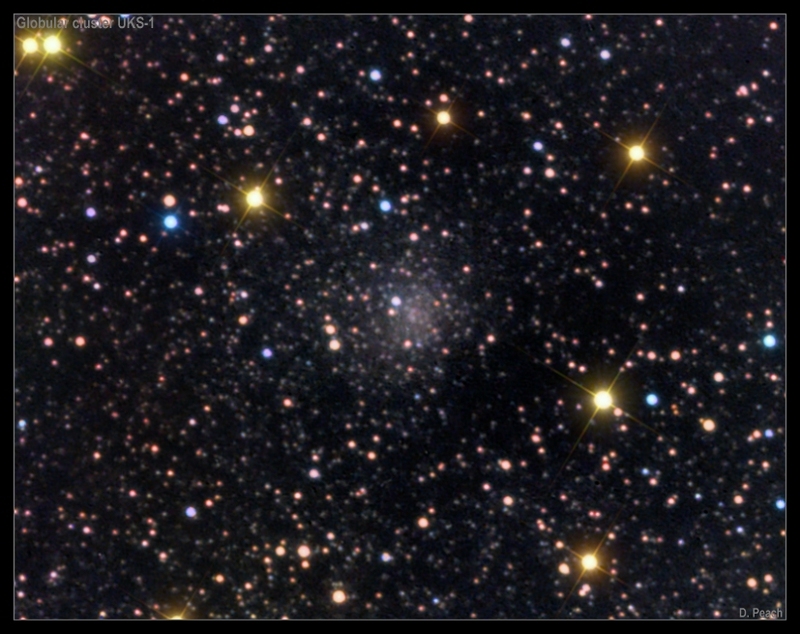 At 4th magnitude it is easily visible to the naked eye and is located very close to the Small Magellanic Cloud in the southern constellation of Tucana. The cluster itself is 16,700 ly away and 120 ly in diameter. It is one of the most massive clusters bound to the Milkyway galaxy containing millions of stars. Spiral galaxy Messier 83 20" CDK at F4.5. FLI-PL6303E camera. L:25mins. RGB:3mins. 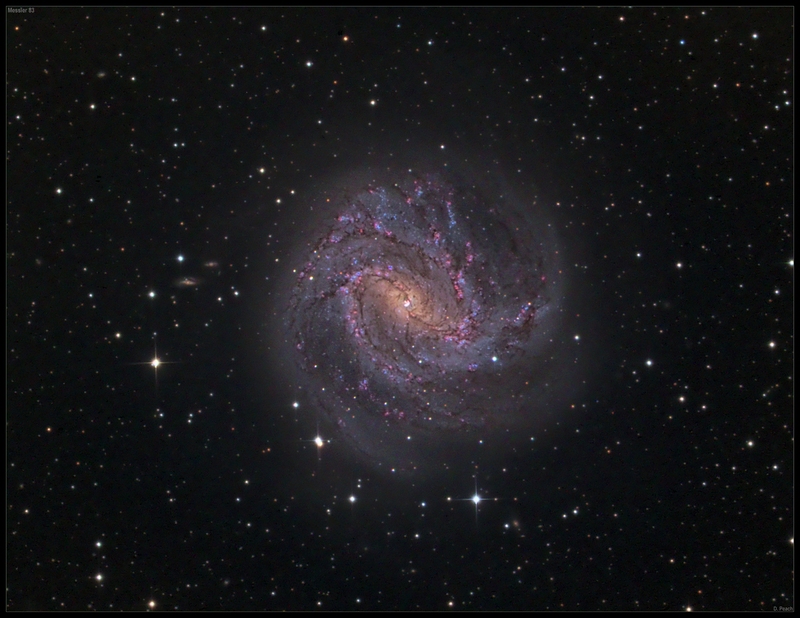 Messier 83 in the constellation Hydra is one of the skies finest spiral galaxies. Its also one of the brighter galaxies in the sky and is visible in binoculars as a small fuzzy patch of light. Its around 15 million light years away and the red patches through the spiral arms are regions of recent and ongoing star formation. 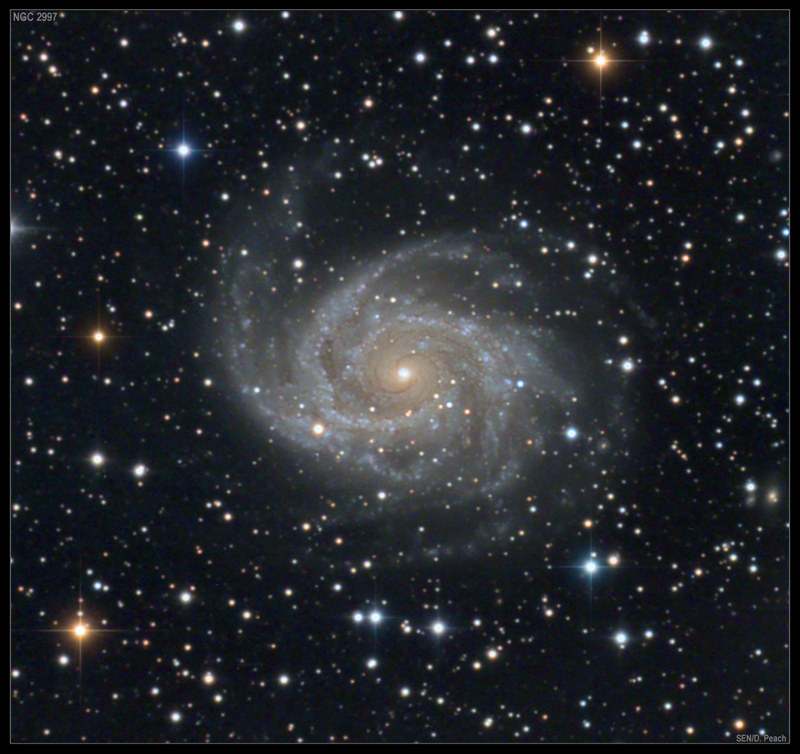 Spiral galaxy Messier 66. 17" CDK@F4.5. FLI camera. L:20mins. RGB: 5mins. April 1st, 2013. 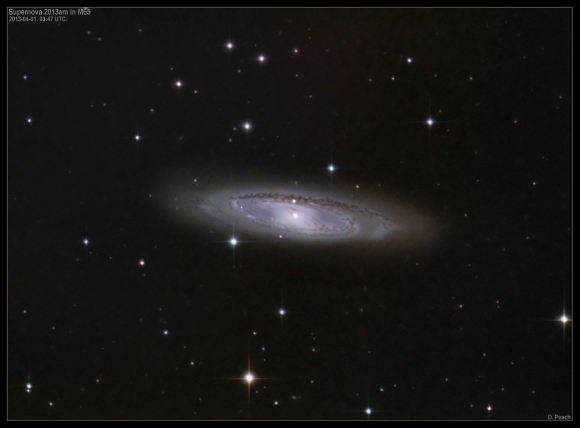 This bright barred spiral galaxy in Leo forms a well known pair with M65 seen below. M66 itself is around 36 million light years away and is easily visible in small telescopes as a fuzzy patch. Many dark dust lanes are visible throughout the galaxy as well as bright star forming regions within the spiral arms. 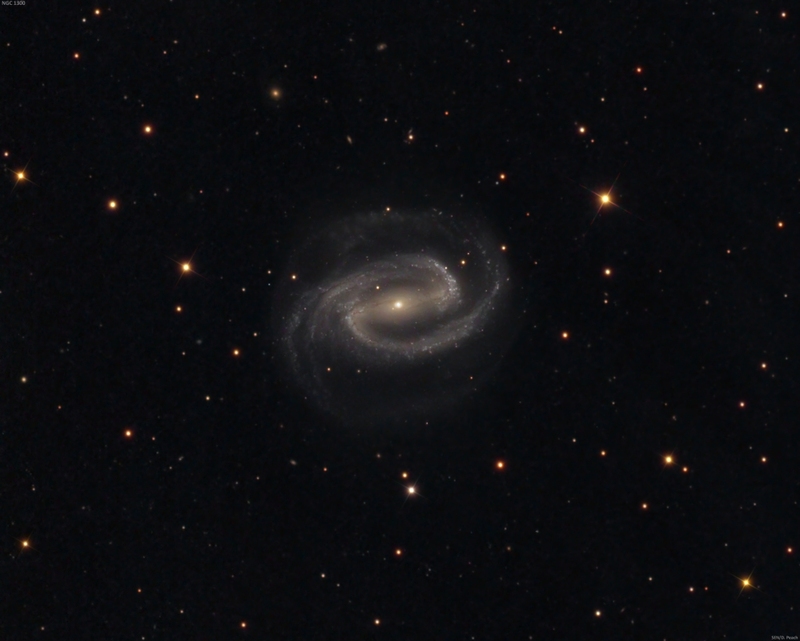 Spiral galaxy Messier 65. 17" CDK@F4.5. FLI camera. L:20mins. RGB: 5mins. April 1st, 2013. This bright spiral galaxy in Leo is currently host to a rather faint supernova seen in the cutout at bottom left. Despite this being a rather nearby galaxy at "only" 35 million light years, lots of dust in the galaxy itself is thought to be to blame for this being fainter than what one expect in a nearby galaxy. 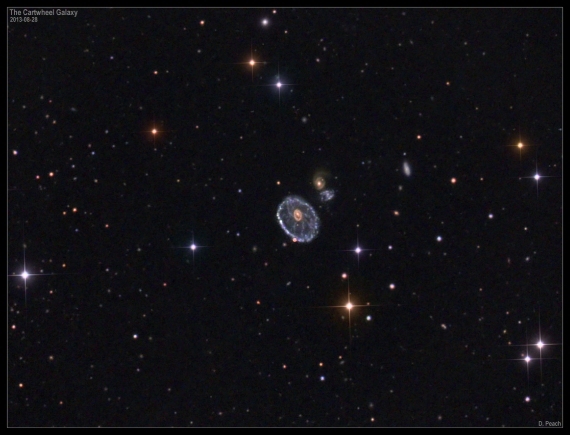 It forms a well known trio with nearby galaxies M66 and NGC3628. NGC 4755 "The Jewel Box" 12.5" RC@F9. STL-11000 camera. RGB: 15mins. March 2013. Without doubt one of the most beautiful open clusters in the sky is NGC 4755 - better known as "The Jewel Box" located in Crux. It contains around 100 stars and is 6400 light years away. The name comes from astronomer Sir John Herschel who described at as "a casket of variously coloured precious stones." Ruprecht 106. 20" CDK@F4.5. FLI camera. L:15mins. RGB: 3mins. March 2013. Little known globular cluster Ruprecht 106 in Centaurus. Discovered in 1961 it was originally misclassified as an open cluster and it wasn't actually confirmed to be a globular until 1990. It is 70,000 l.y. distant and 11th magnitude. It is also thought to be quite young in age compared to most globulars. 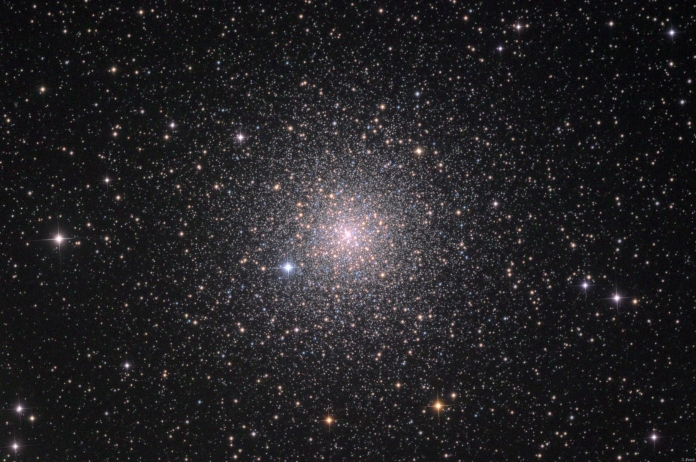 Globular cluster NGC 6397. 12.5" RC@F9. STL-11000 camera. L:15mins. RGB: 3mins. Feb 2013. 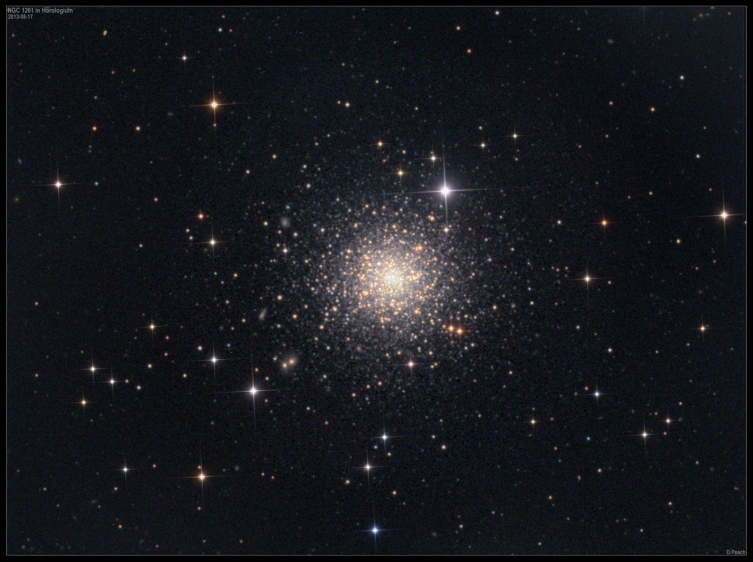 Located in the constellation Ara, this globular cluster is 6th magnitude and a nice site in small telescopes. It is the second closest cluster of its kind to our galaxy laying 7,200 light years from our Solar System. It is around 70 light years in diameter and contains around half a million stars. Hoag's Object. 20" CDK@F4.5. 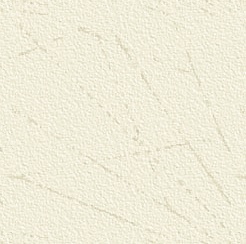 FLI-PL002M. L:25mins. RGB:5mins. February 2013. Hoag's Object in Serpens is one of the sky's most enigmatic galaxies. This 16th magnitude rare type of galaxy is 600 million light years away and it seems there is still much debate on exactly how it formed. The outer ring is about 120,000 light years in diameter and is composed of hot blue stars while the nucleus is composed of older yellow stars. It was discovered in 1950 and targeted by the Hubble Space Telescope in 2001. You can read more on this galaxy here. 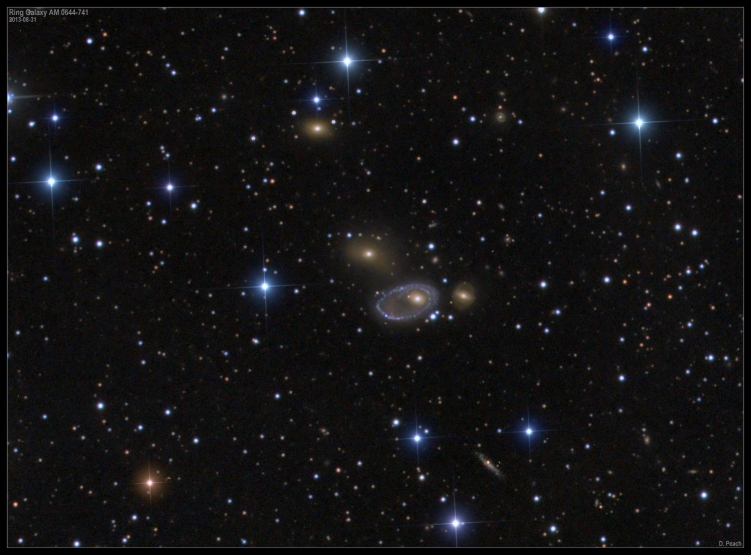 Galaxy cluster Abell 2218. 17" Planewave CDK. FLI-PL6303E camera. L:30mins. RGB:5mins. February 2013. The remote galaxy cluster Abell 2218 in the constellation Draco is one of the sky's richest and largest galaxy clusters. Its immense distance from us however (2 billion light years) means that sadly it is very faint and visible only in large telescopes. The above images reveal a plethora of galaxies down to around 21st magnitude. 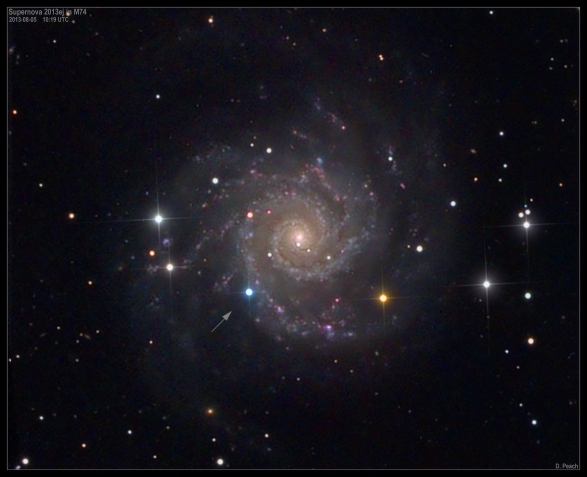 Note the bright foreground spiral galaxy which is not part of the cluster. 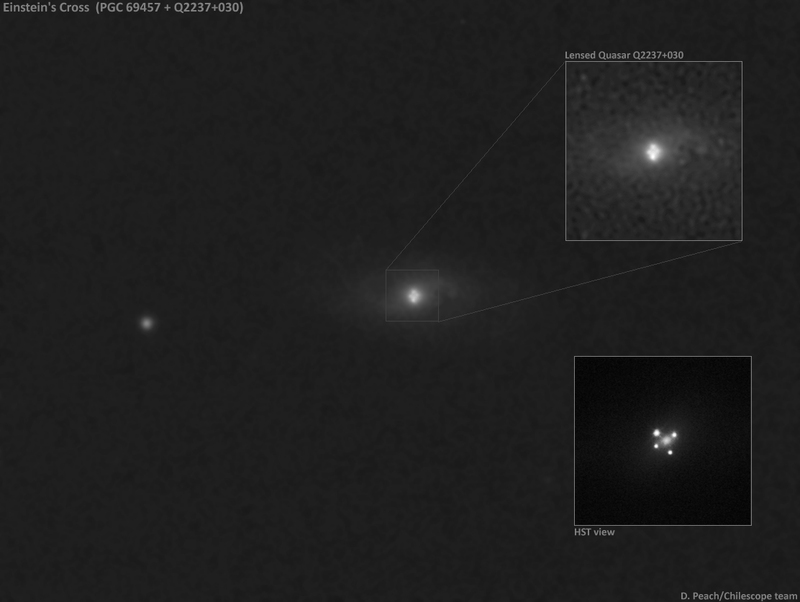 The massive gravity of the cluster causes gravitational lensing hints of which can be seen in the images. Messier 42. 10" Takahashi Epsilon Astrograph. STL-11000 CCD camera. November 2012. This bright diffuse Nebula located in the constellation of Orion is among the sky's most photographed and observed objects. It lays at a distance of around 1300 light years from Earth and spans about 24 light years in diameter. It is the nearest star forming region to Earth and contains many small proto planetary disks - the beginnings of new solar systems. At its centre is the famous trapezium star cluster - four close stars arranged in a trapeziod shape. 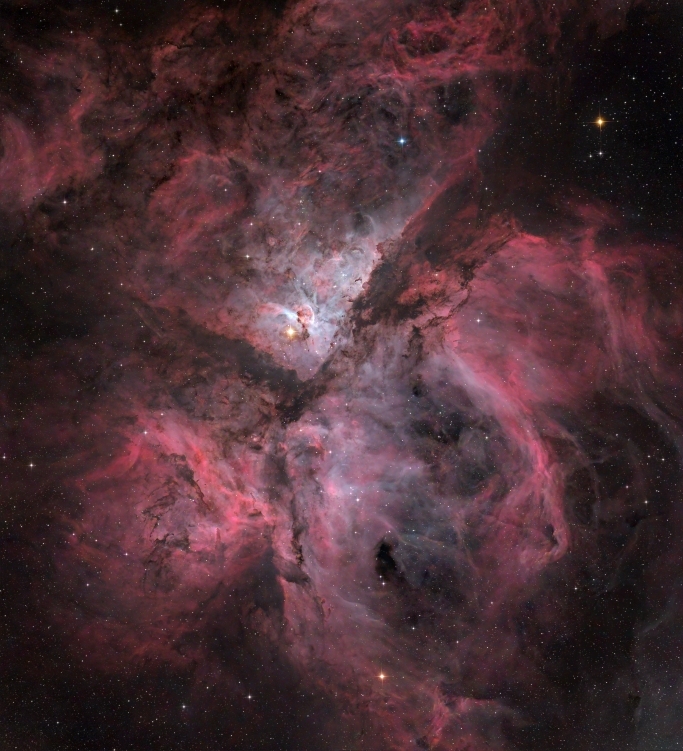 These young stars are responsible for much of the illumination of the nebula itself. Copyright © 2003-2013. www.damianpeach.com. No material used within this website may be used, amended or distributed without the consent of the webmaster.